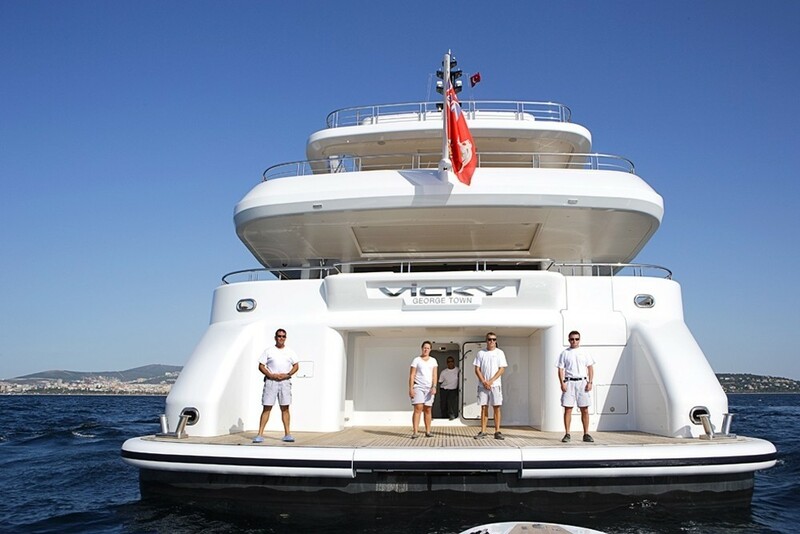 Launched in 2012, the 72.64m motor yacht Vicky (hull NB54) is a spectacular vessel, built by the renowned Turkish shipyard, Proteksan Turquoise. 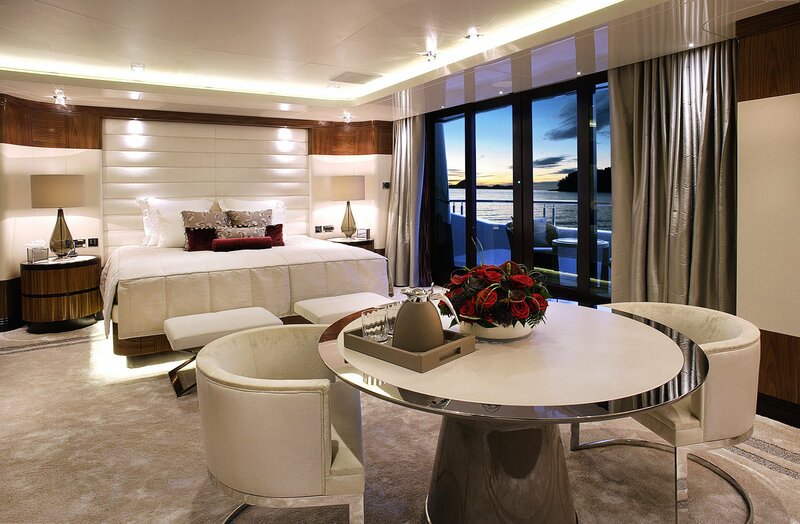 She features both exterior as well as interior by H2 Yacht Design and offers comfortable accommodation to 12 guests in 6 lovely cabins. 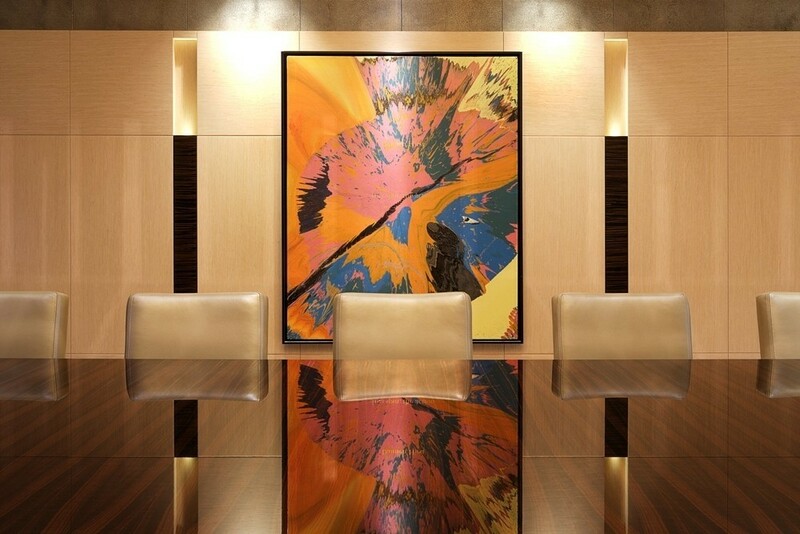 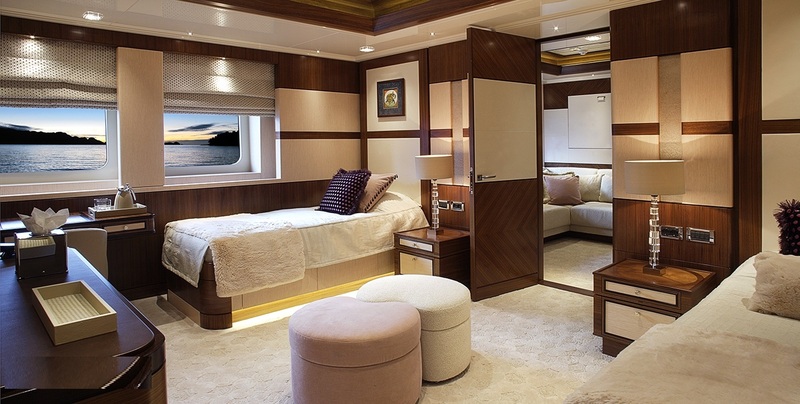 VICKY's interior styling is rich and vibrant. 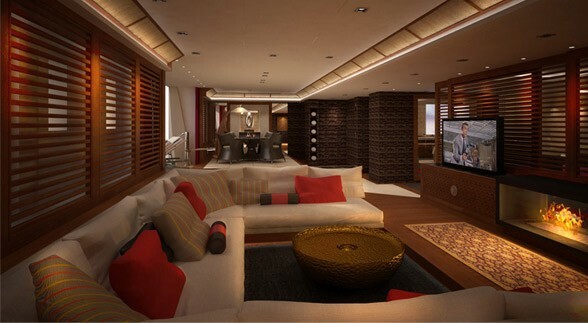 It is comfortable, with a mix of light woods and fabrics as well as contemporary furniture and traditional carpentry. 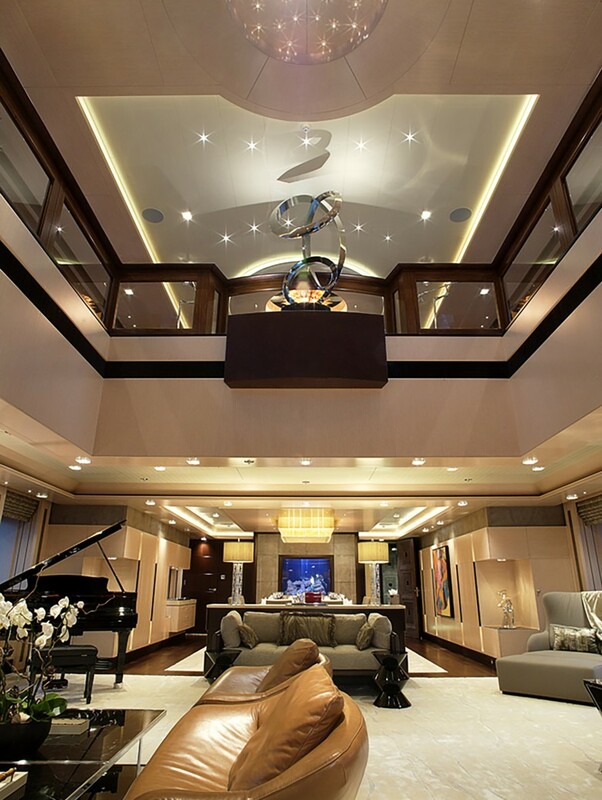 There is a spacious open layout with design elements such as a unique double-height atrium in the main salon that enhances an overall feeling of space. 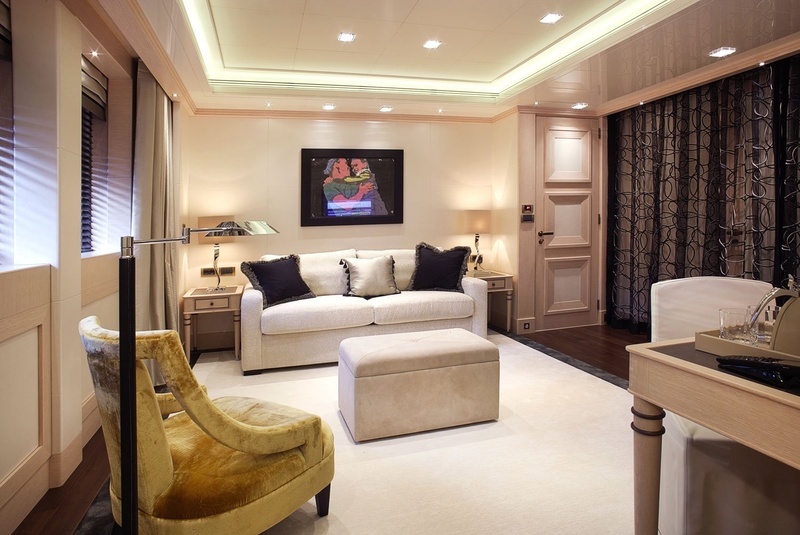 There is plenty of light throughout, which gives a relaxed and residential feeling too. 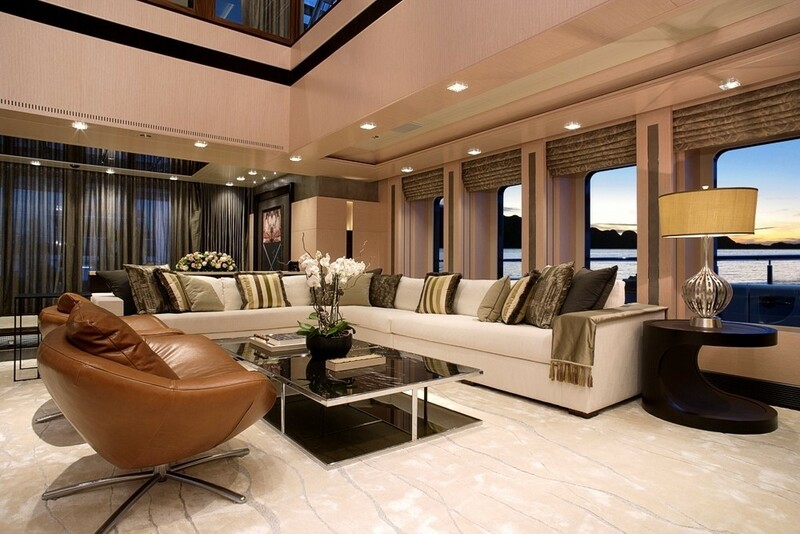 Her open spaces are clean and modern and her exterior lines are flowing and sleek. 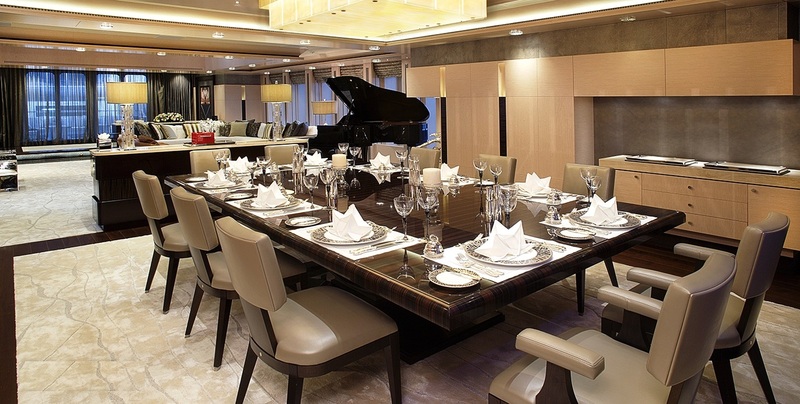 VICKY boasts excellent lounging and dining areas, with attractive features to attract all personalities. 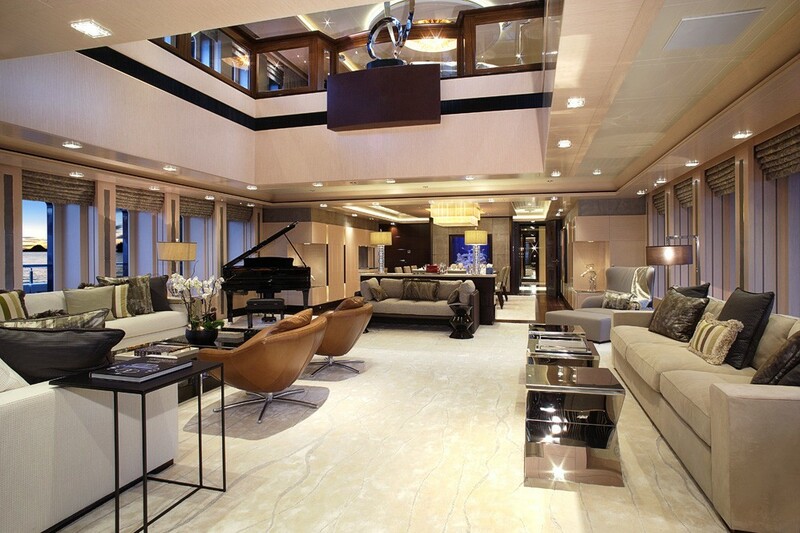 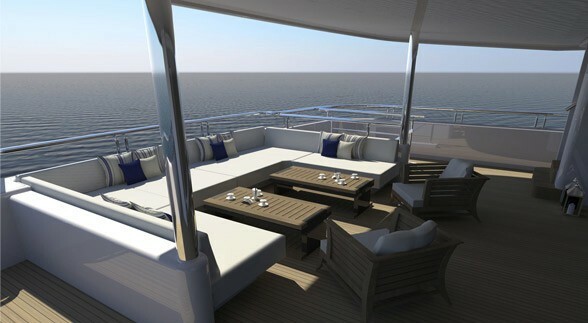 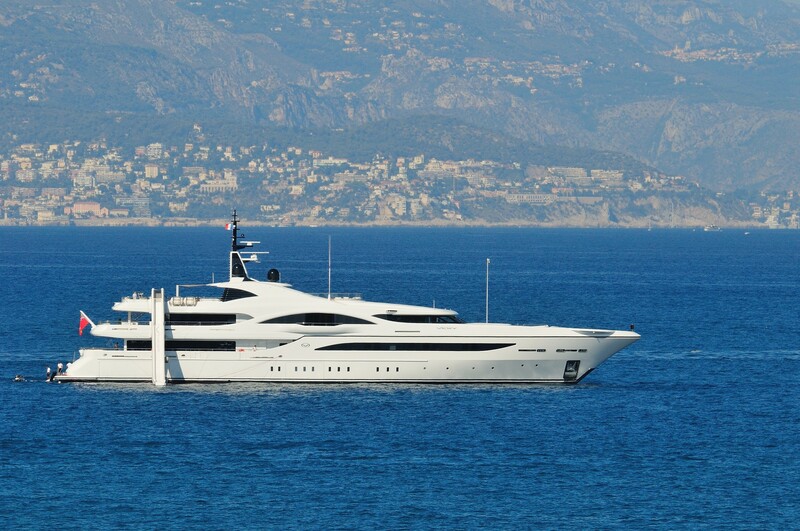 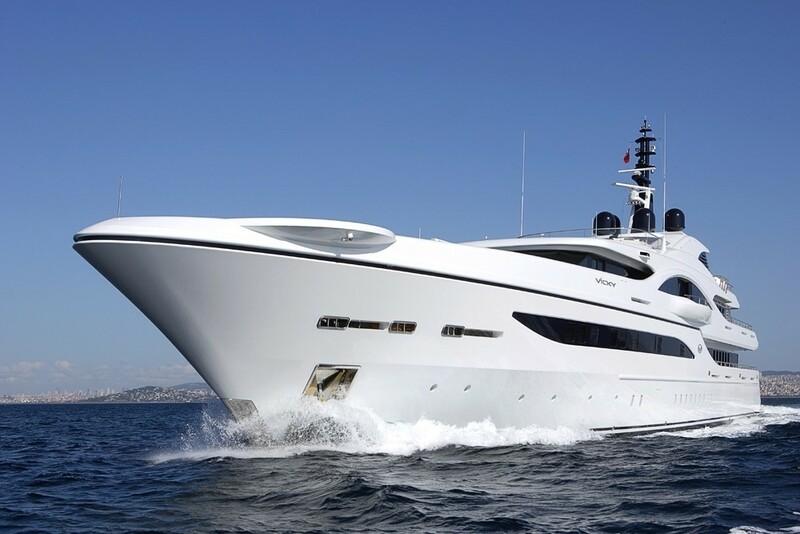 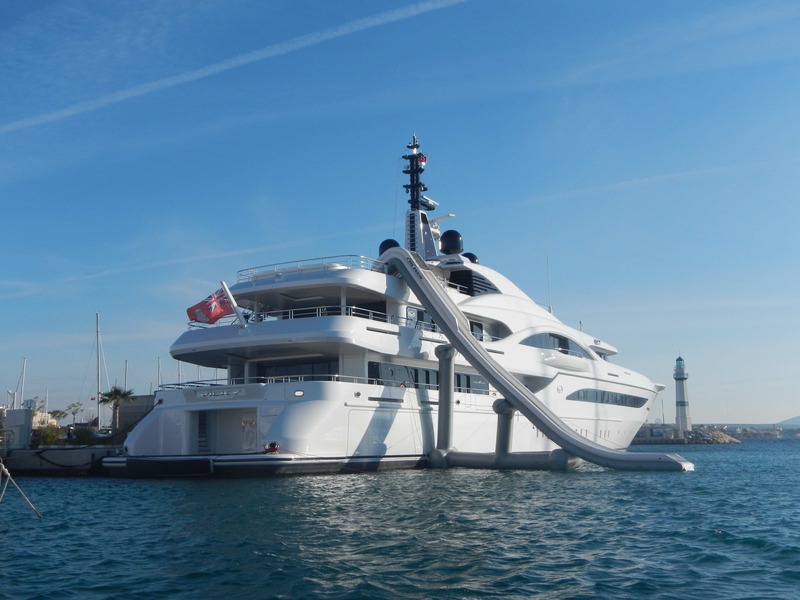 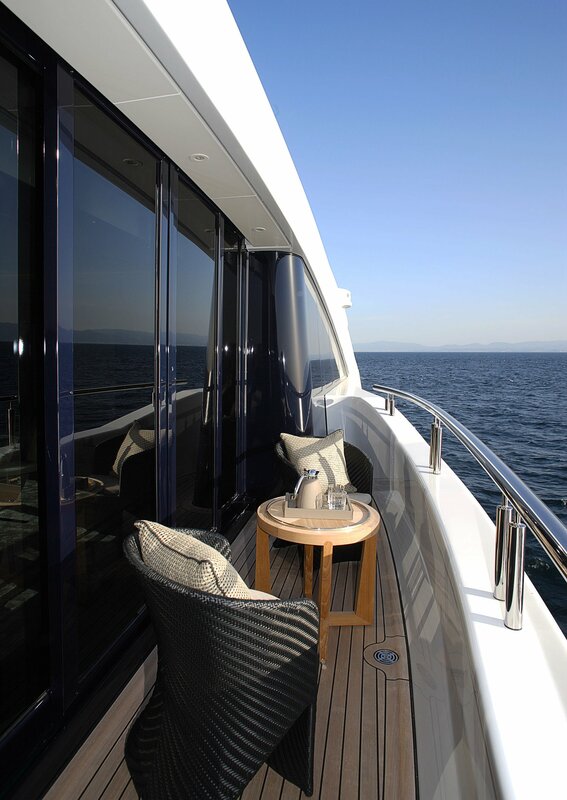 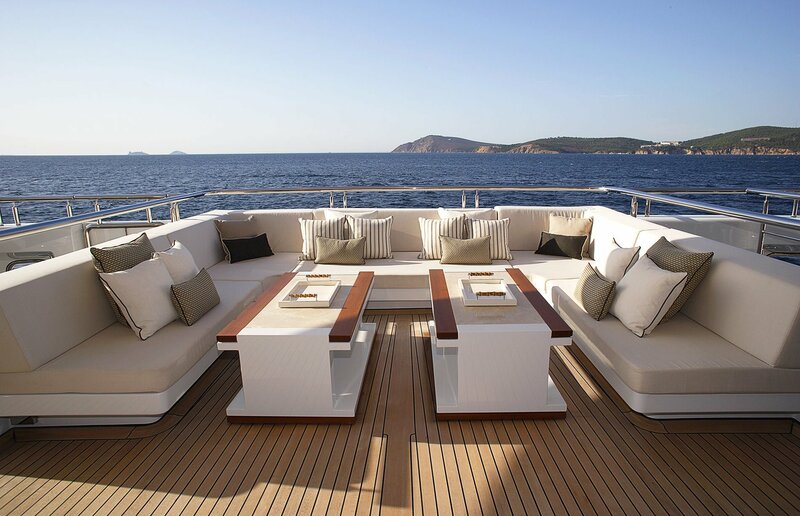 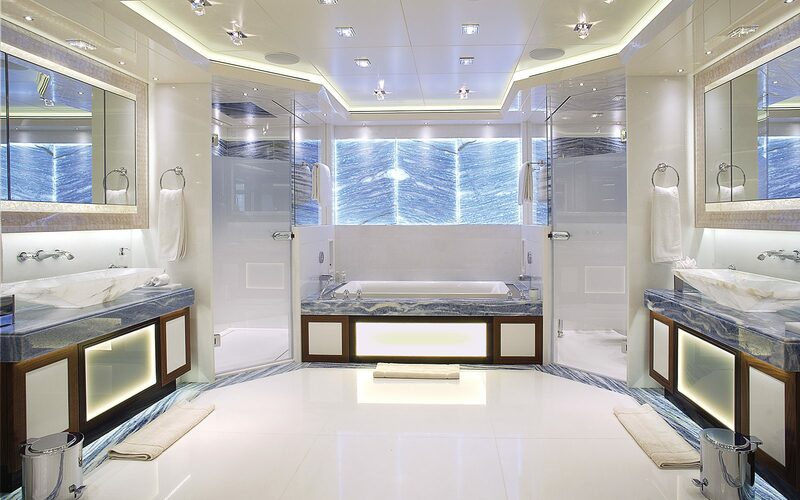 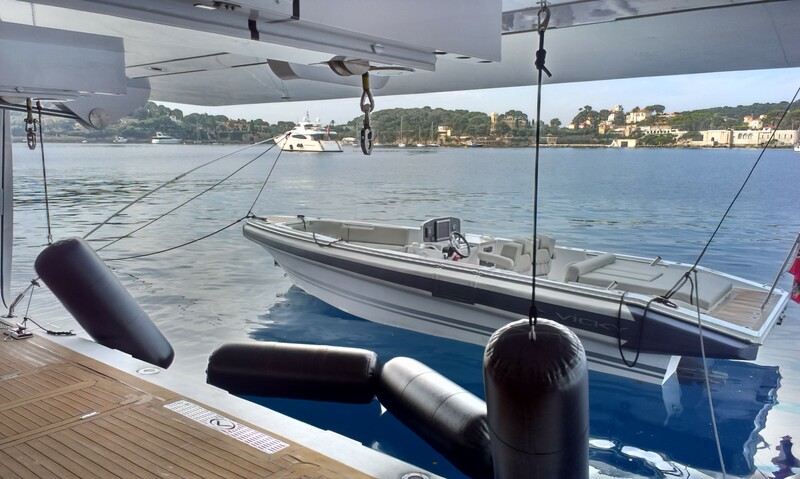 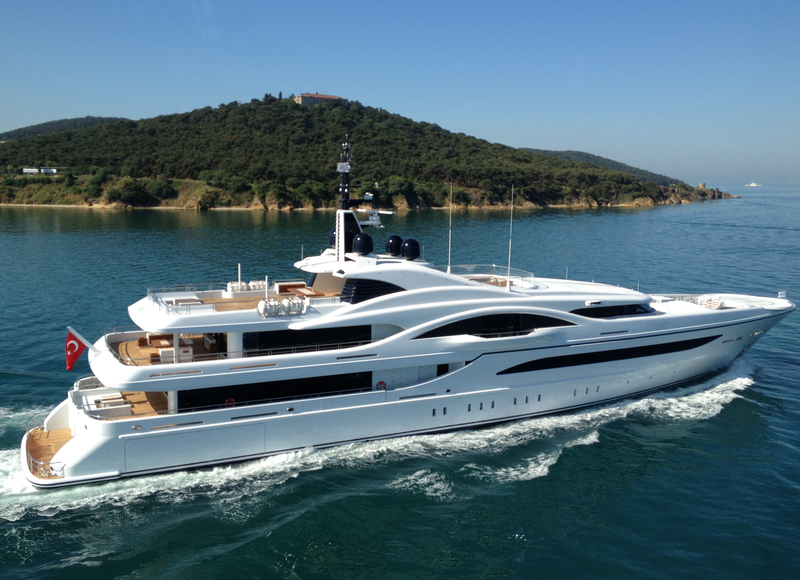 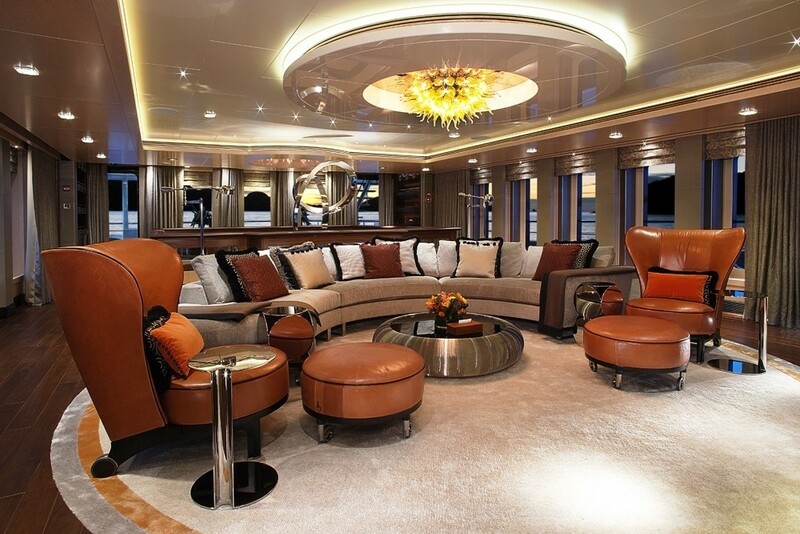 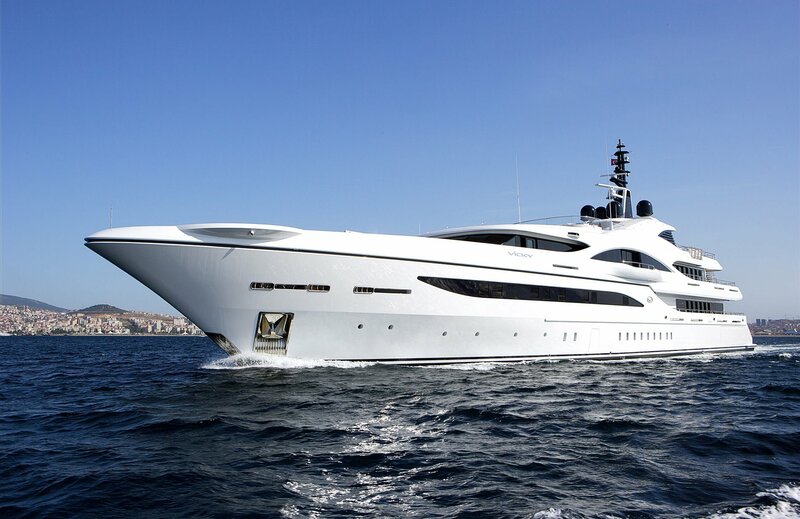 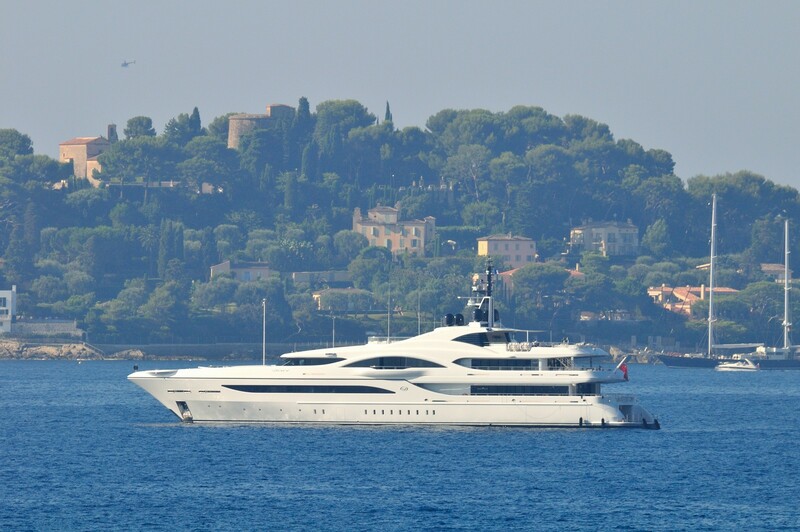 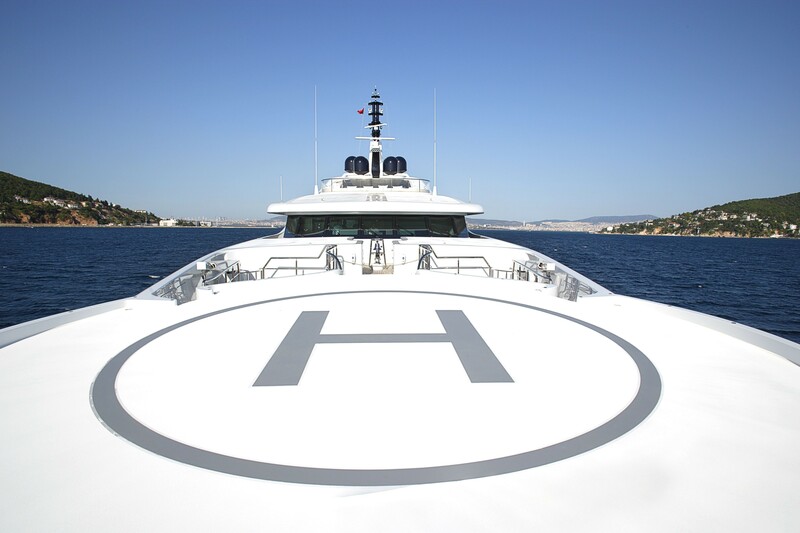 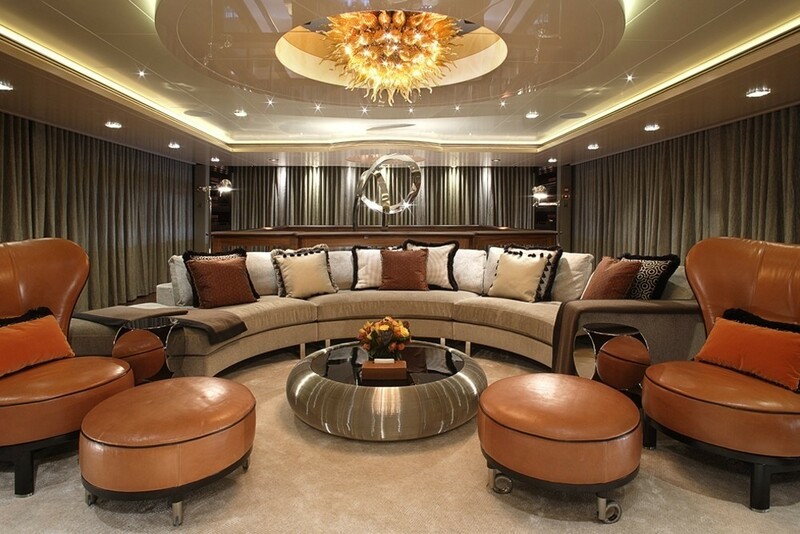 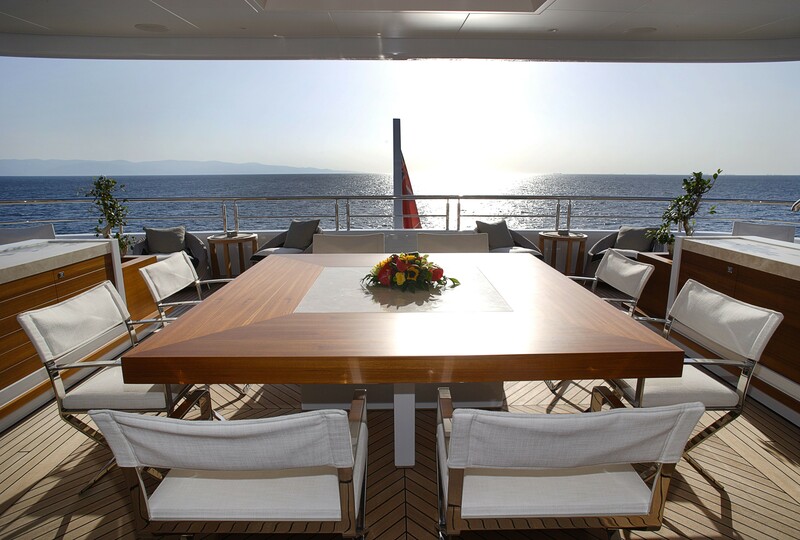 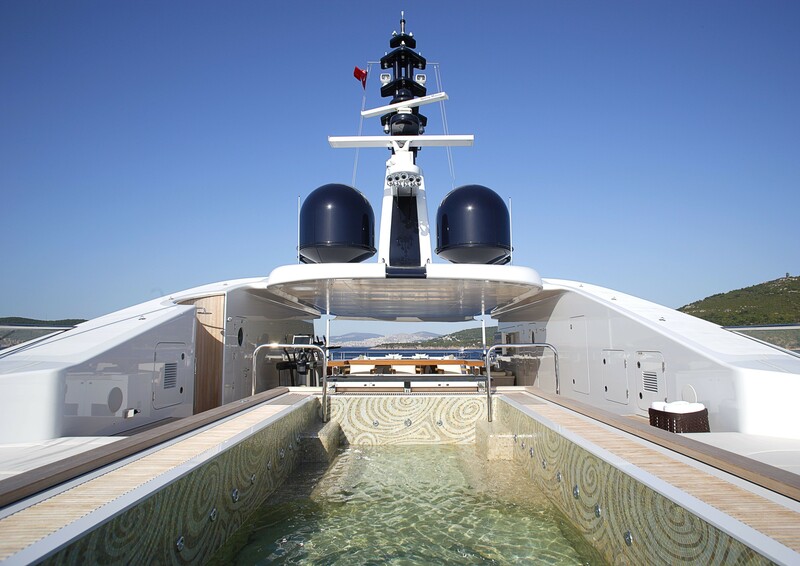 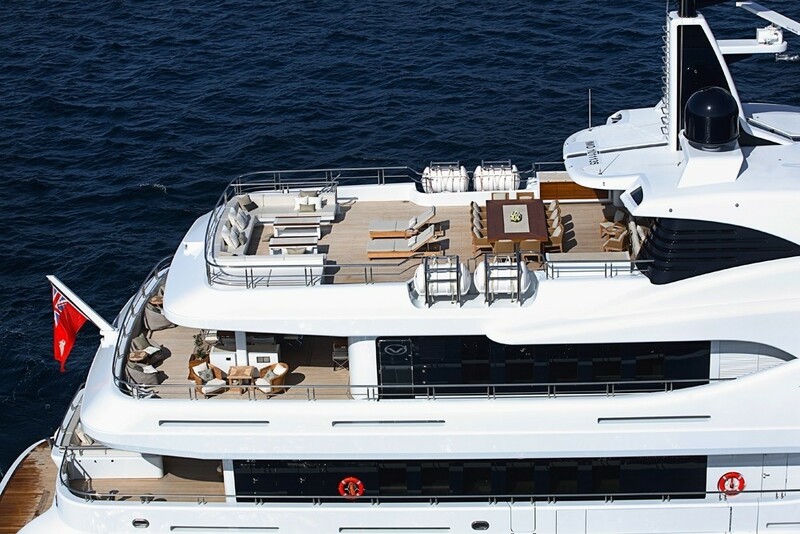 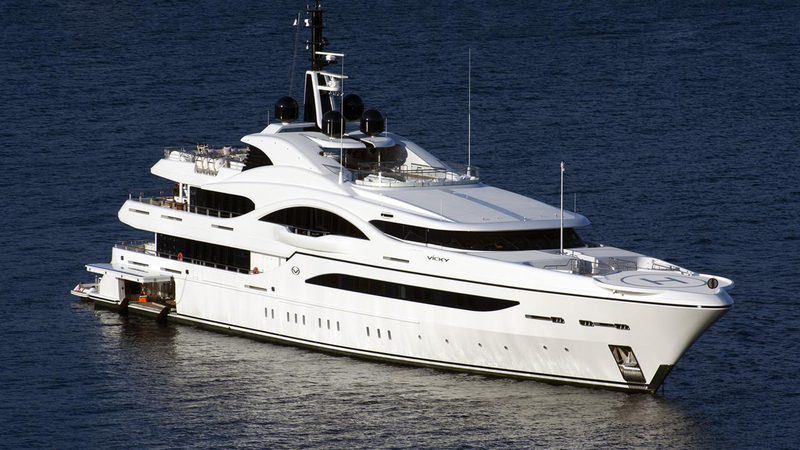 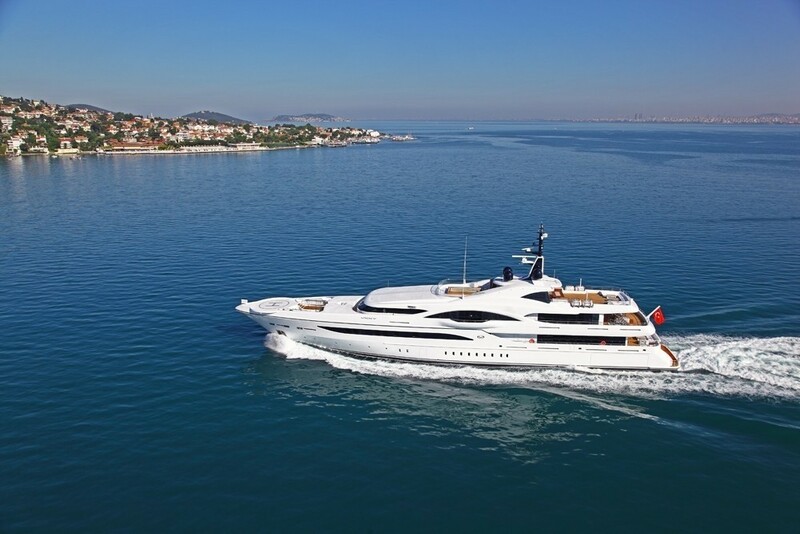 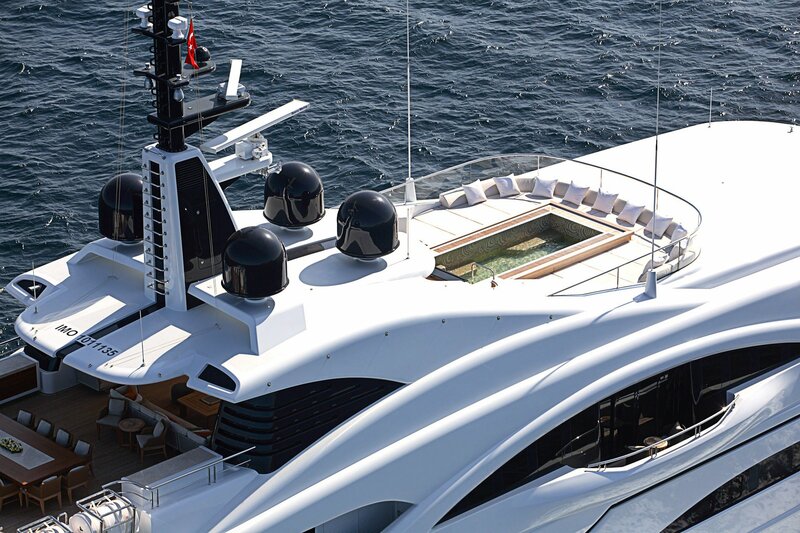 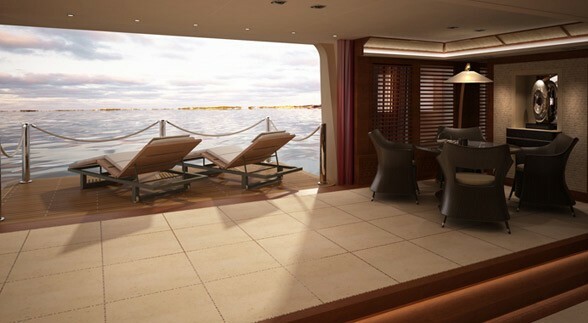 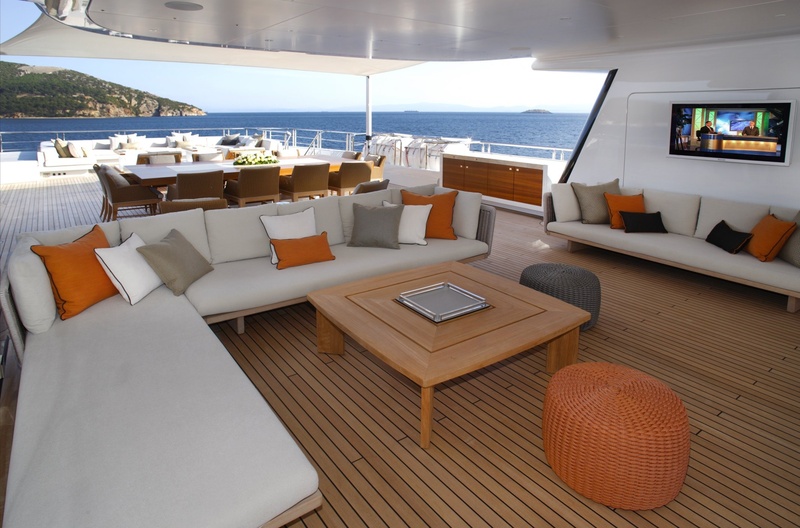 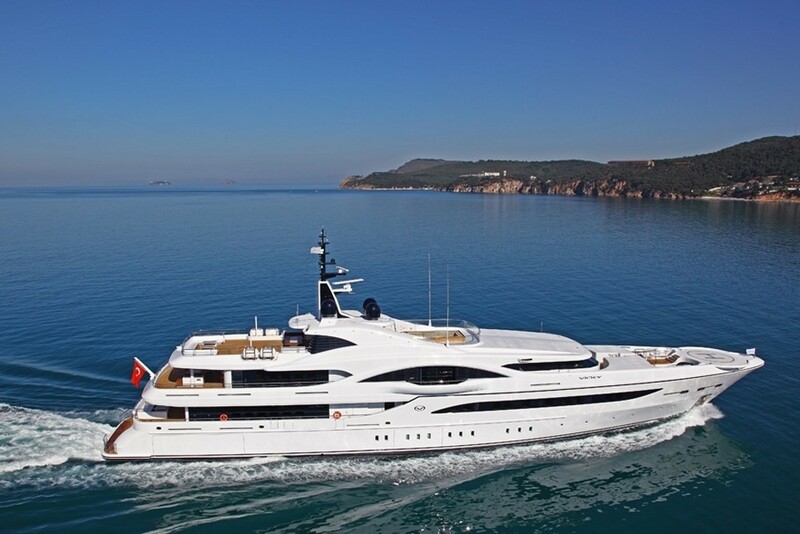 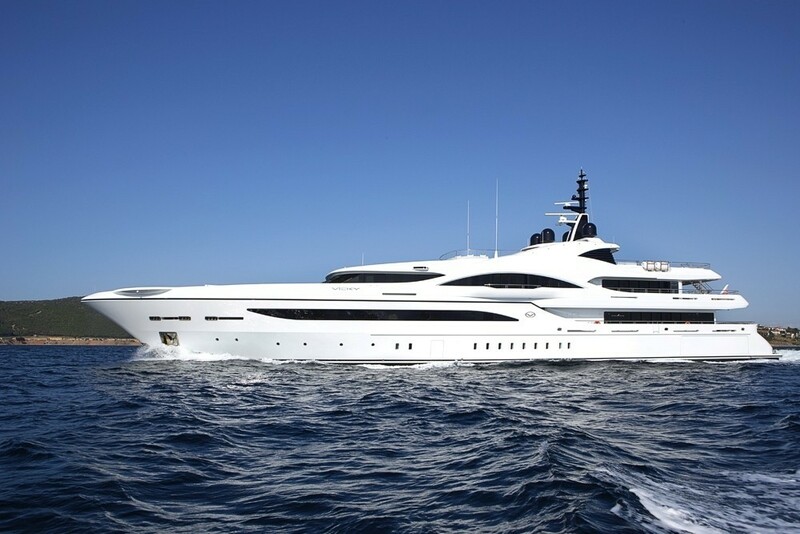 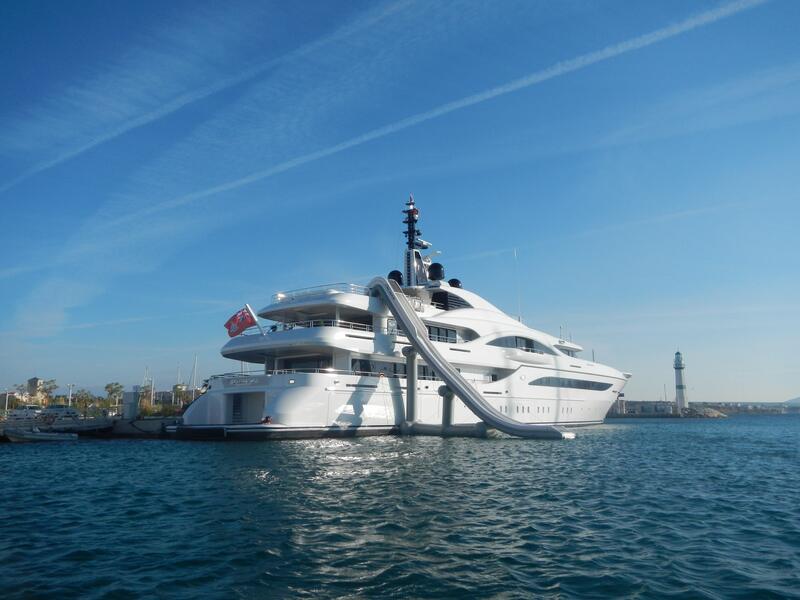 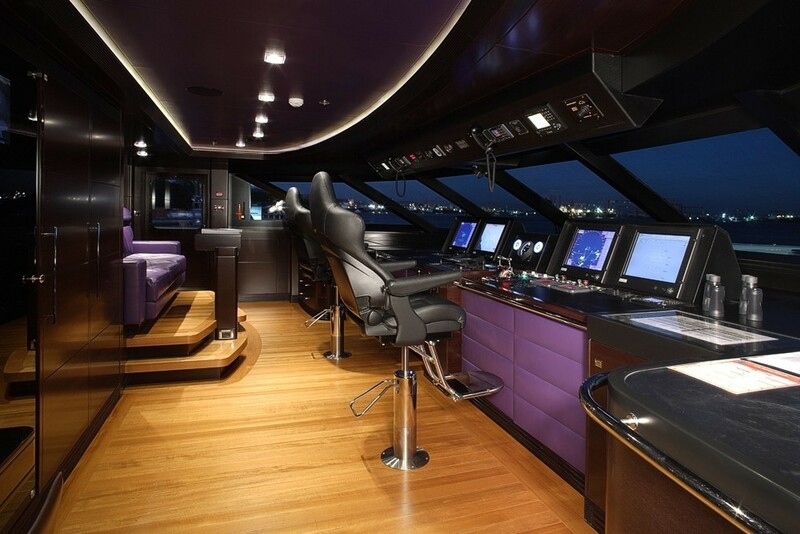 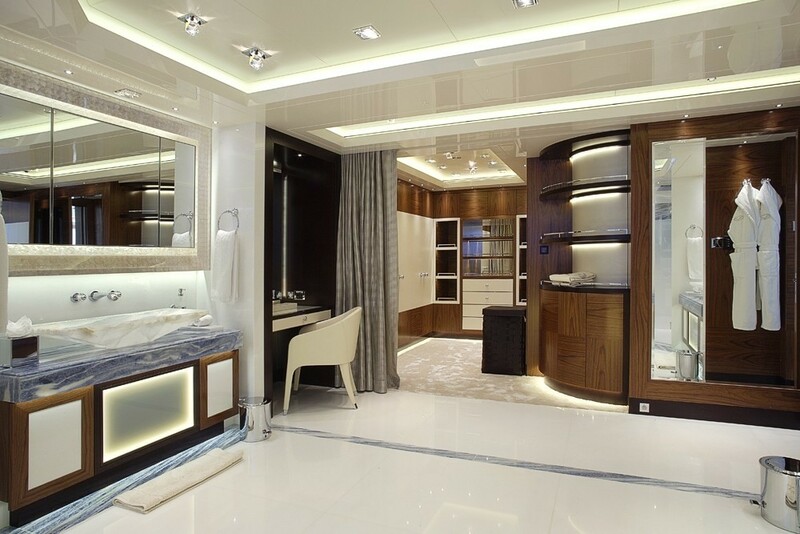 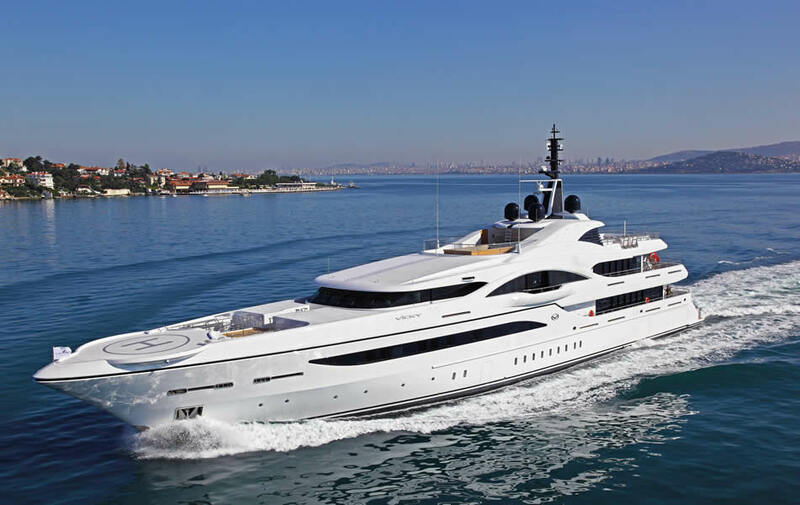 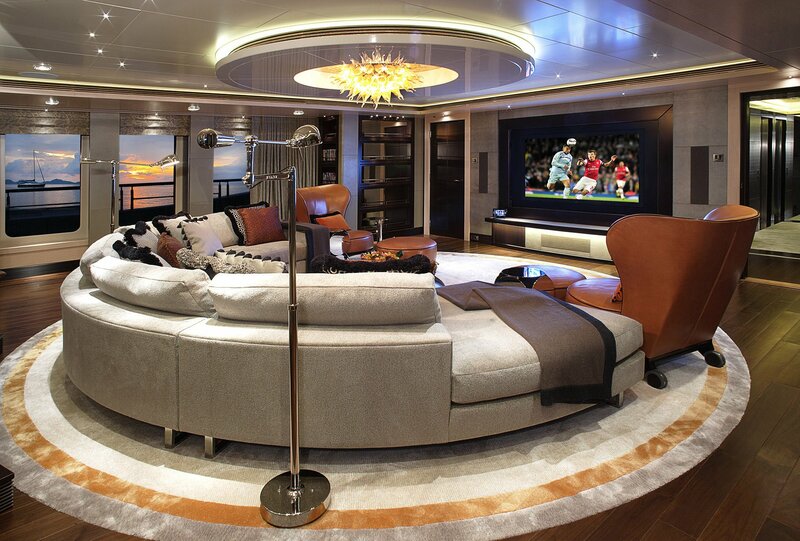 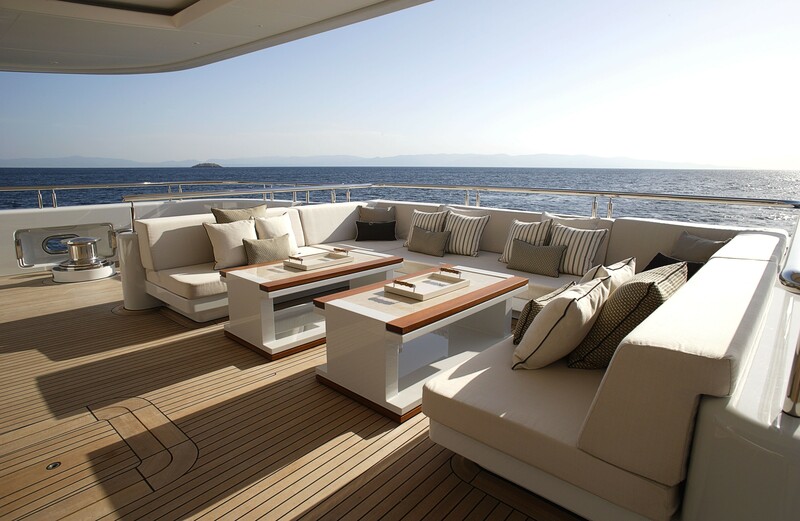 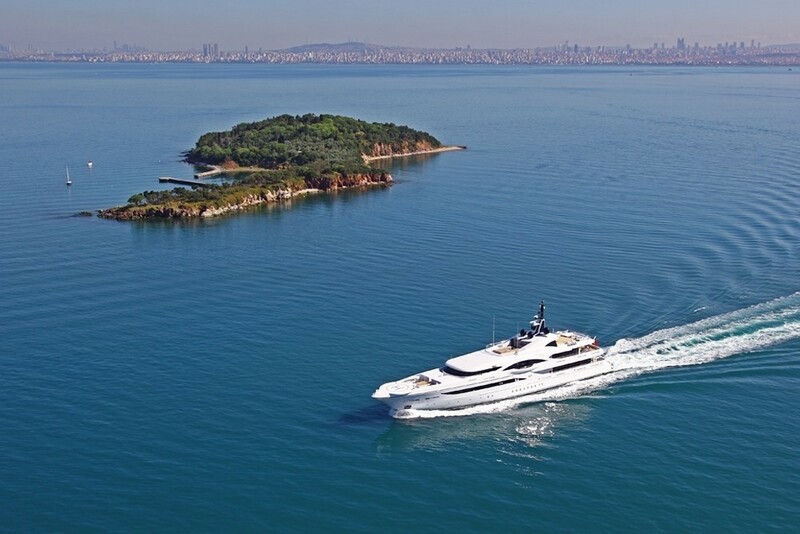 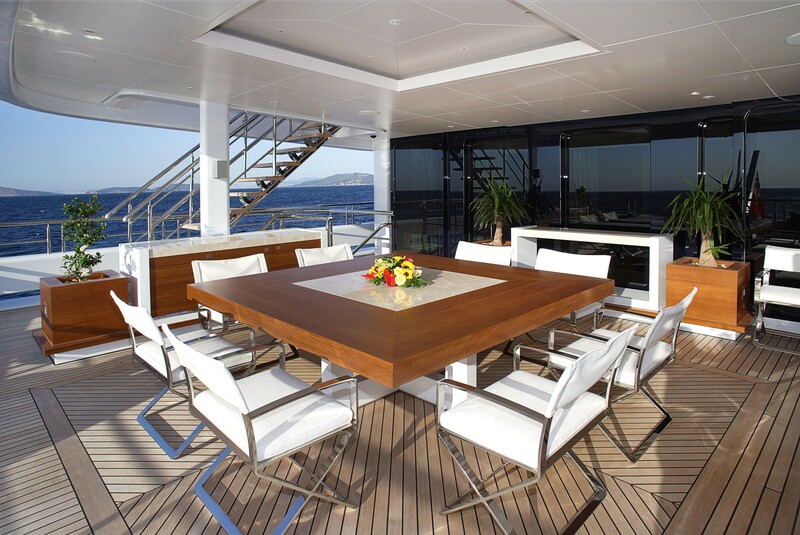 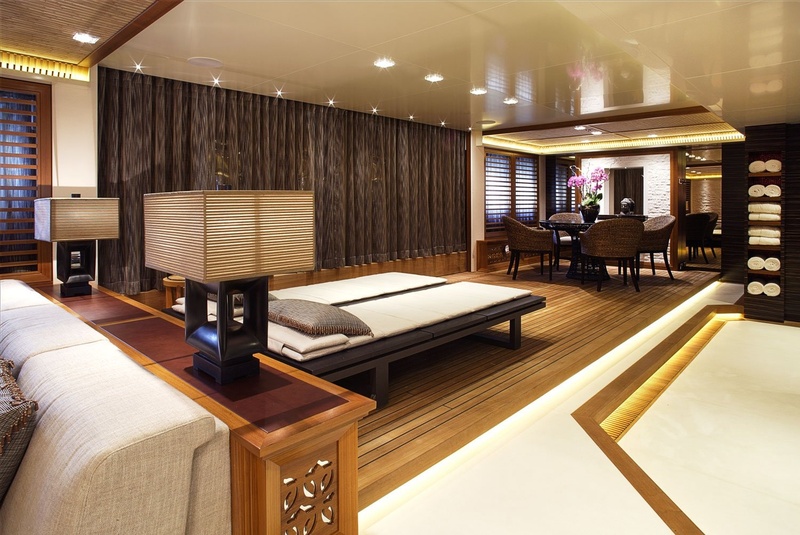 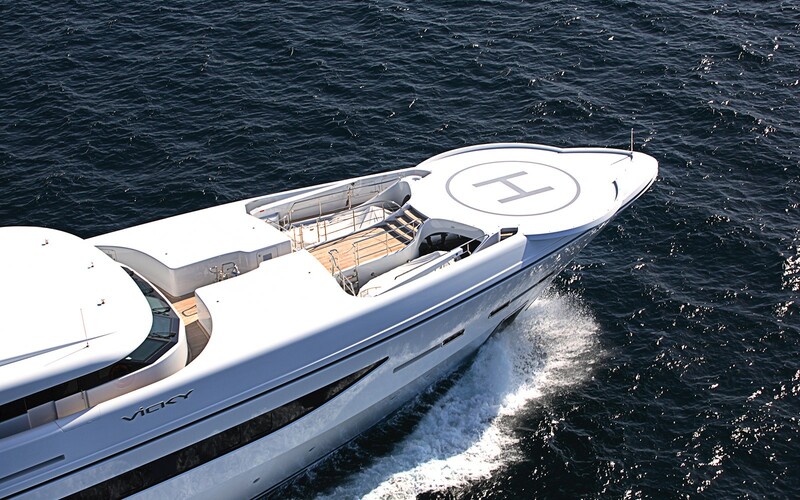 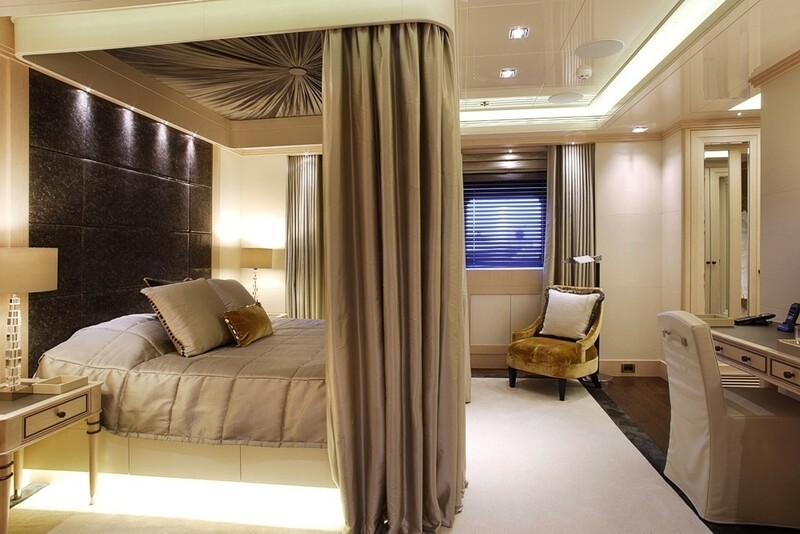 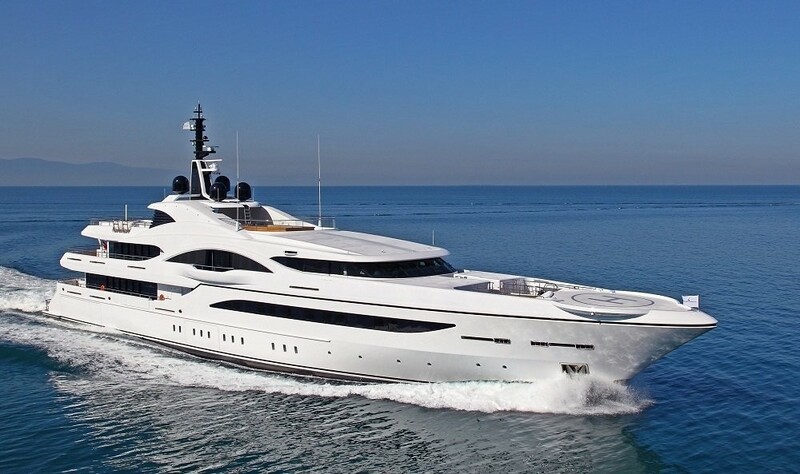 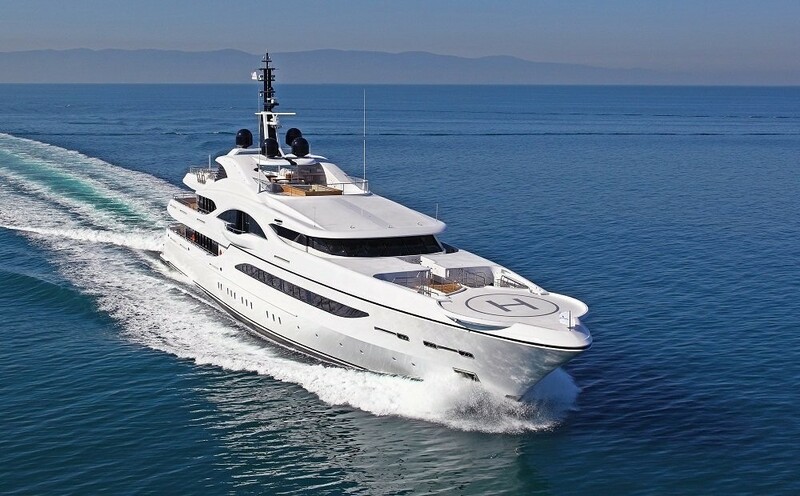 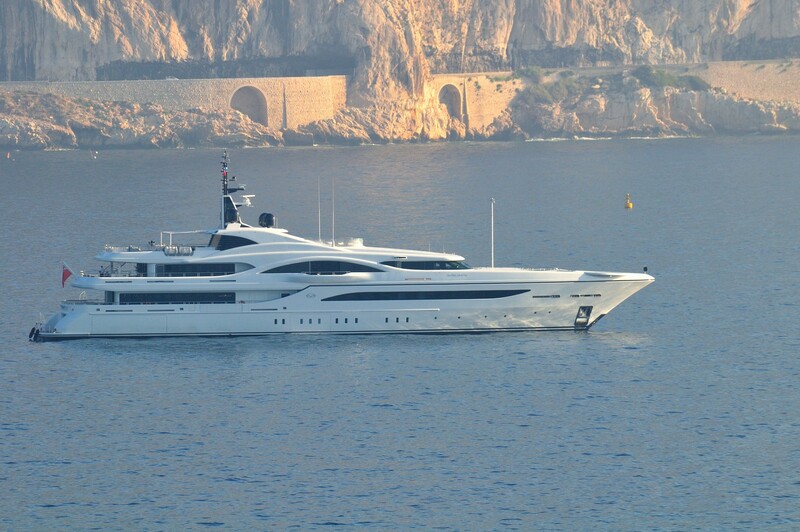 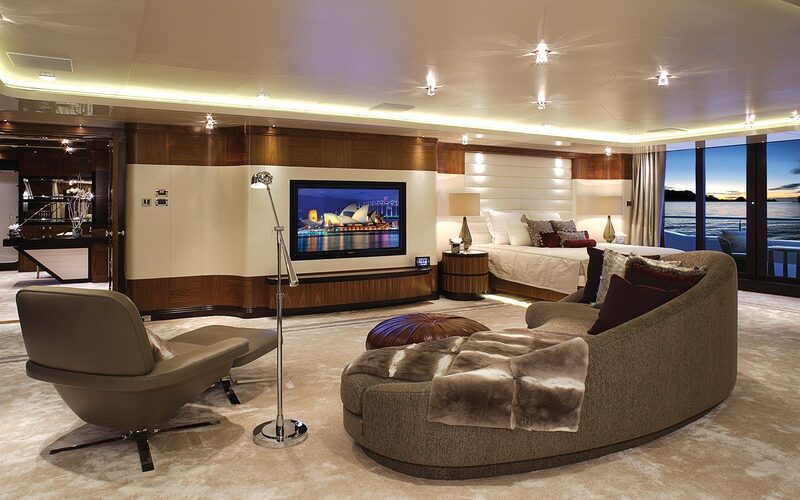 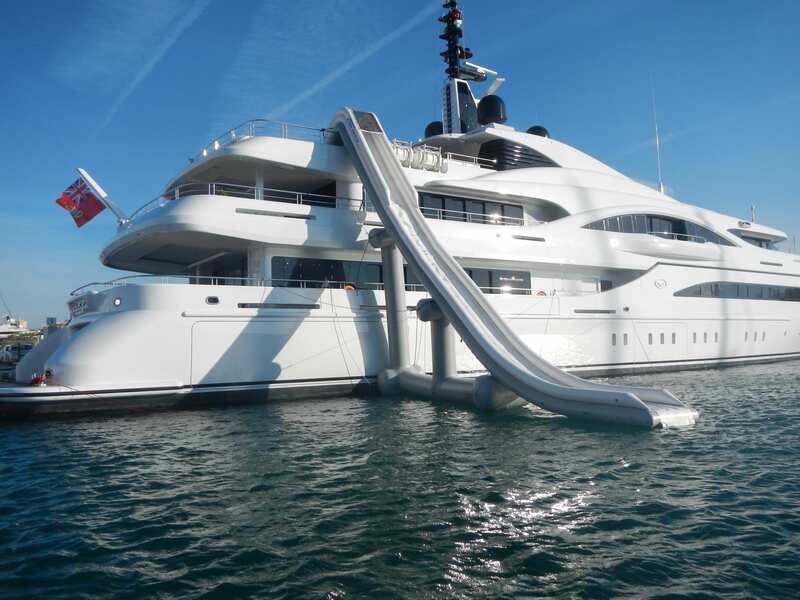 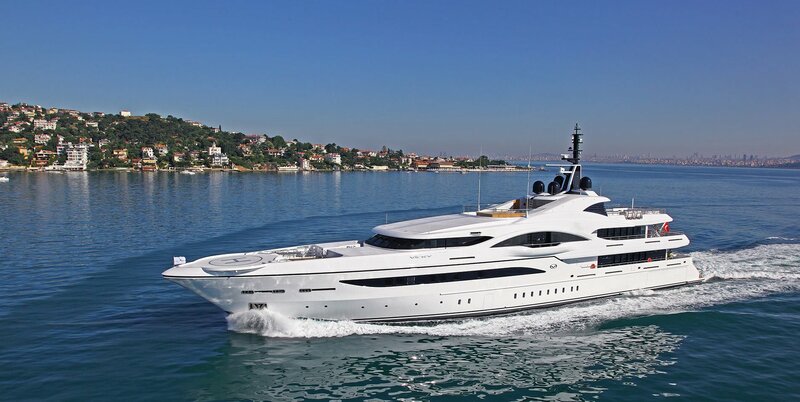 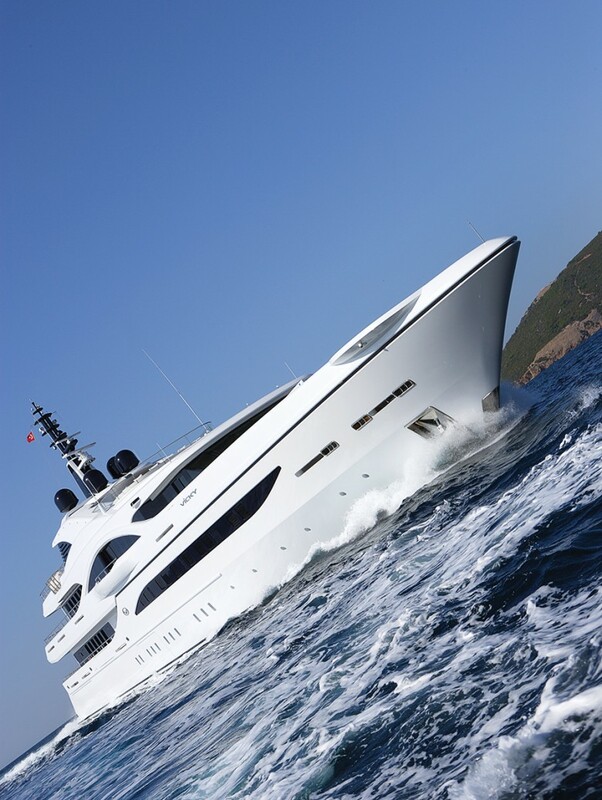 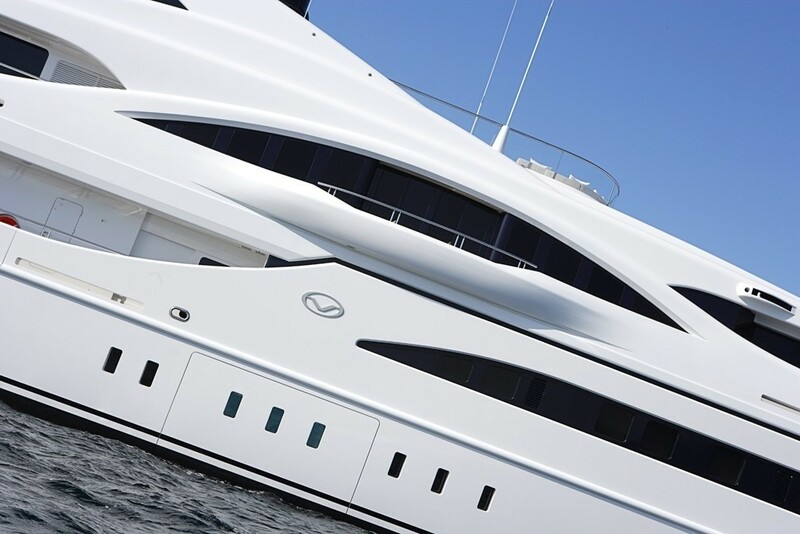 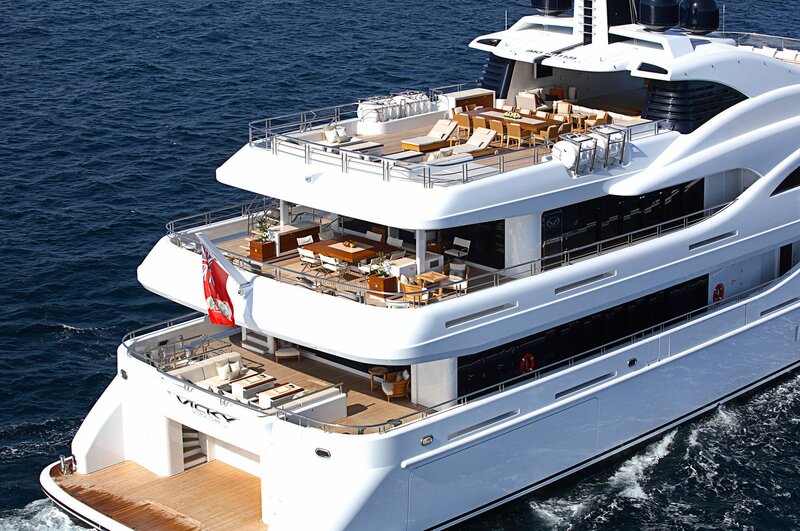 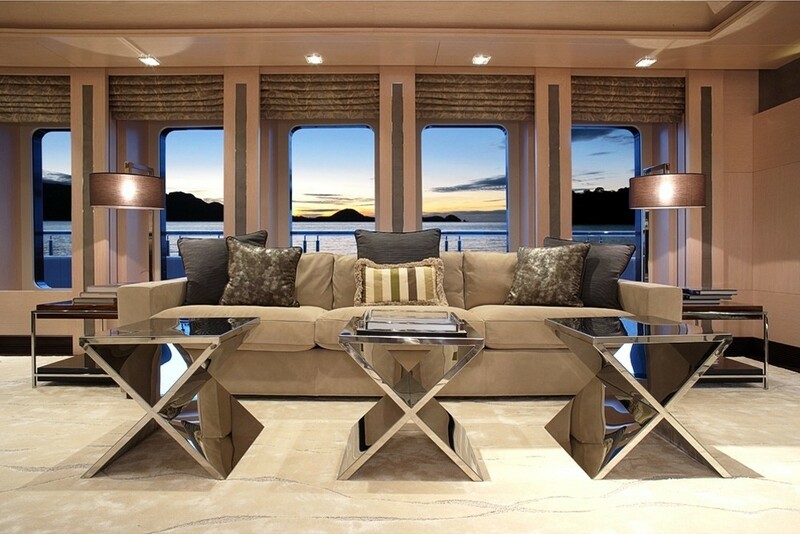 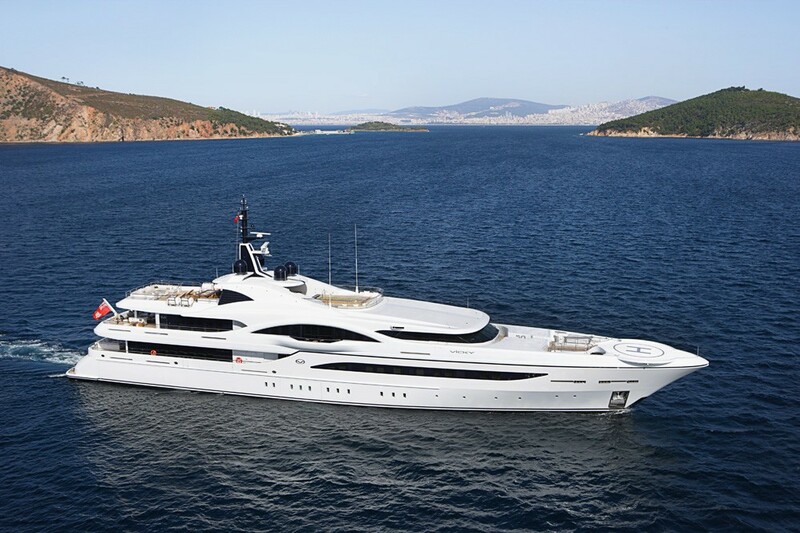 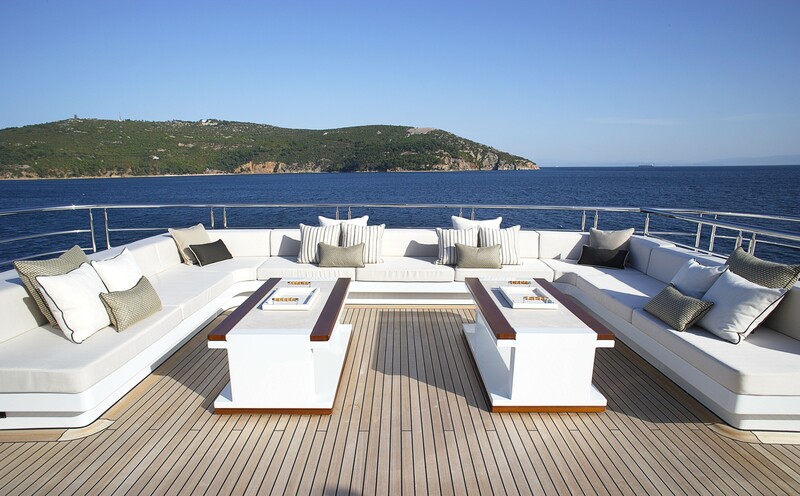 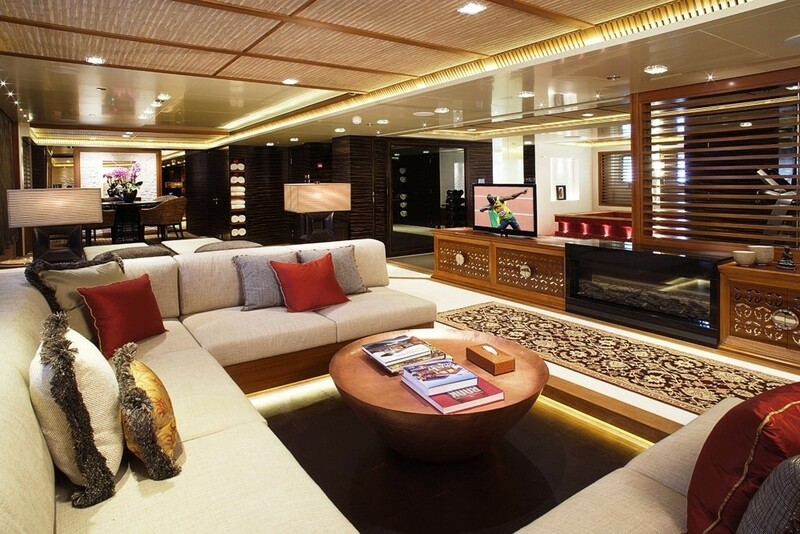 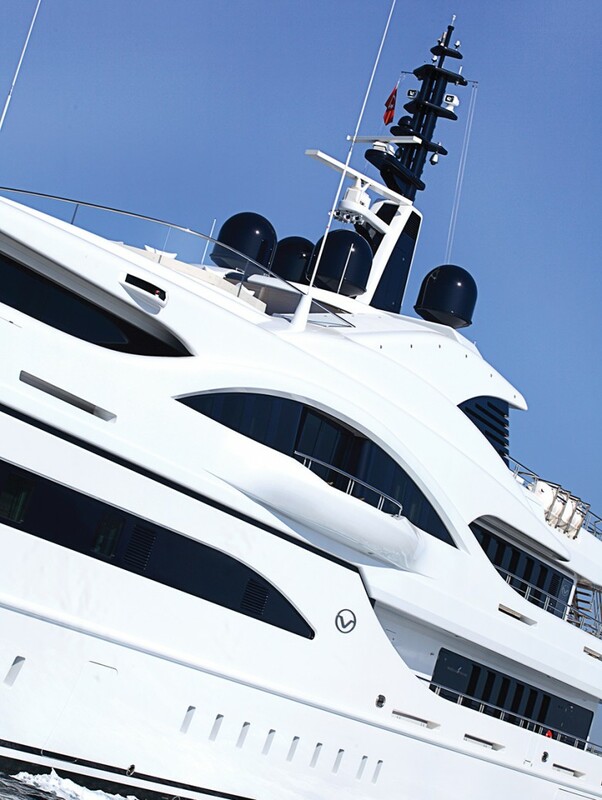 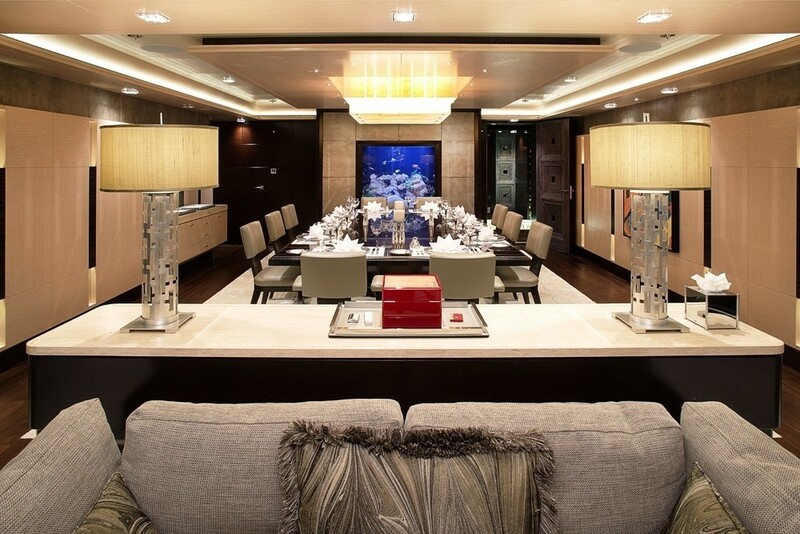 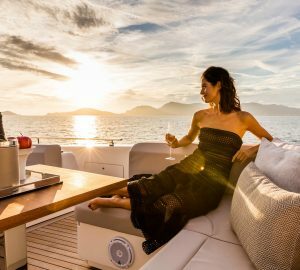 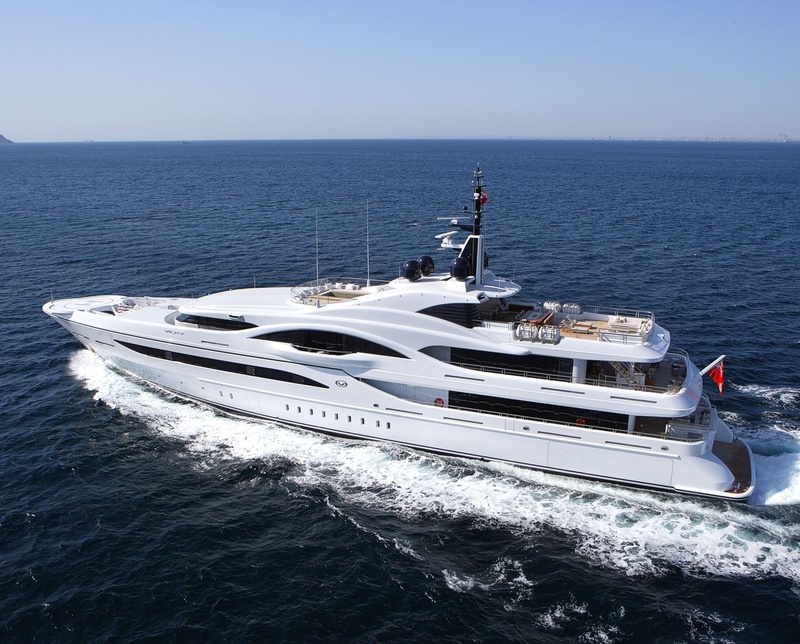 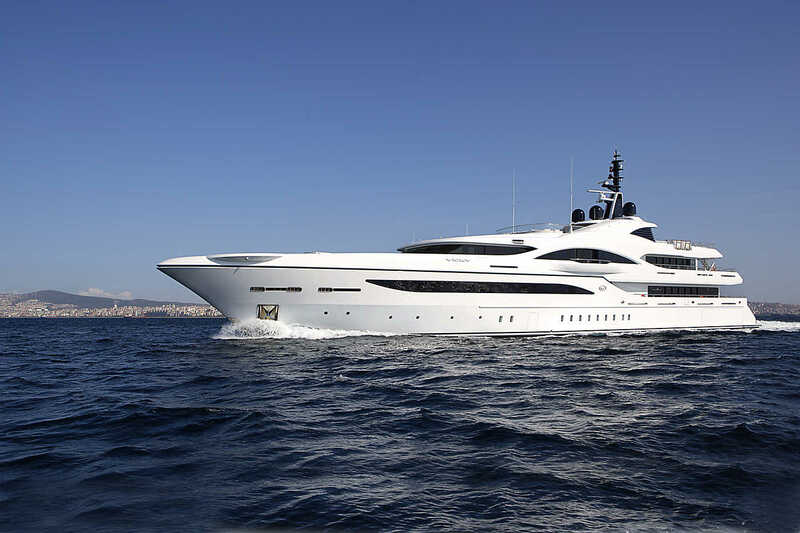 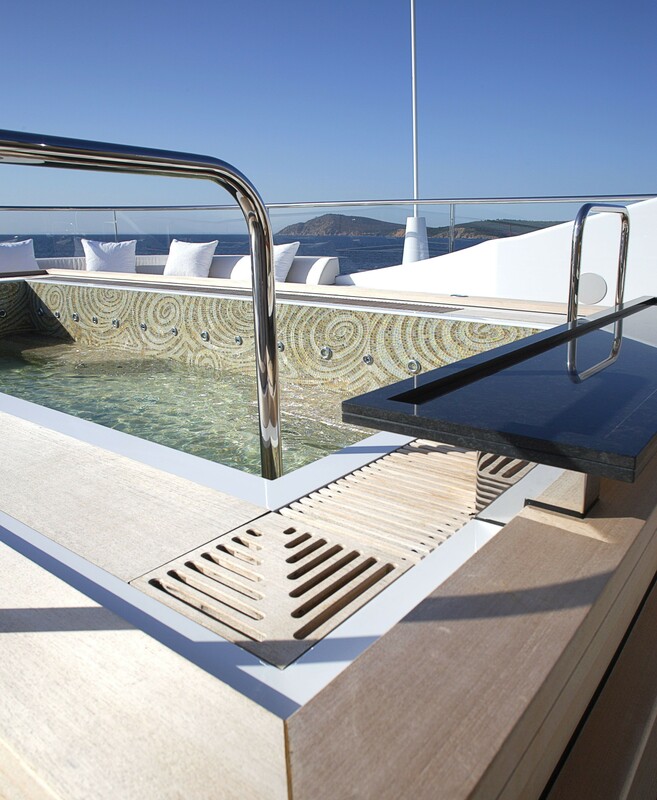 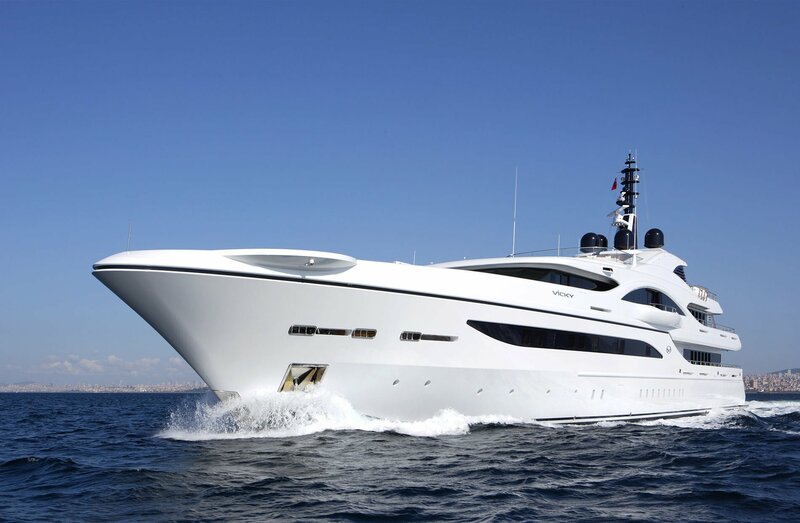 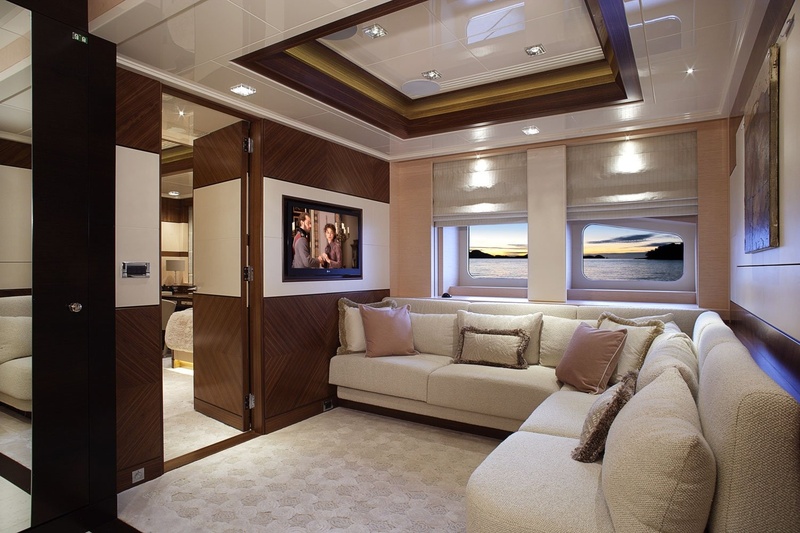 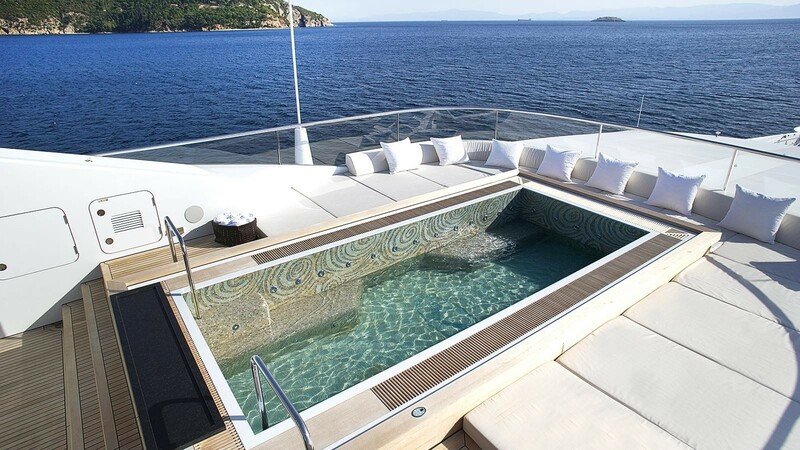 She is definitely a multi-functioning yacht with a "wow factor", dedicated to comfort and facilities. 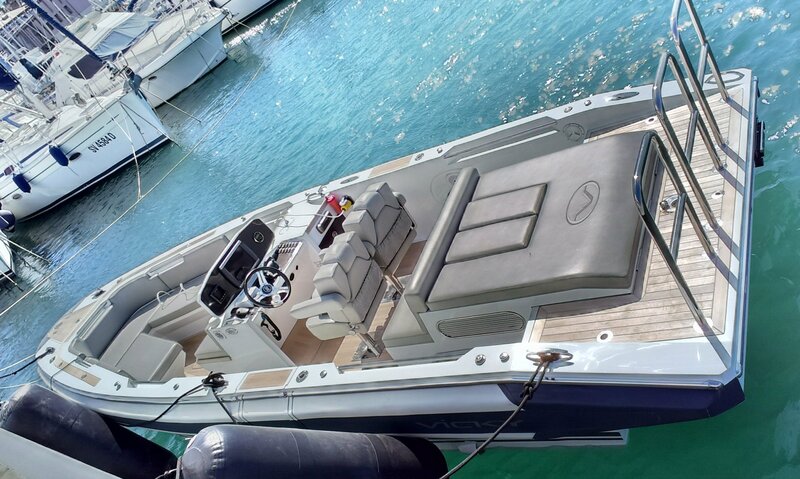 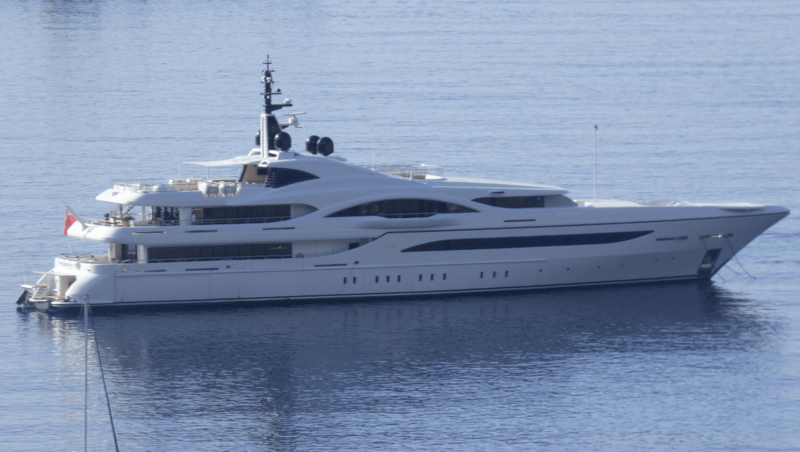 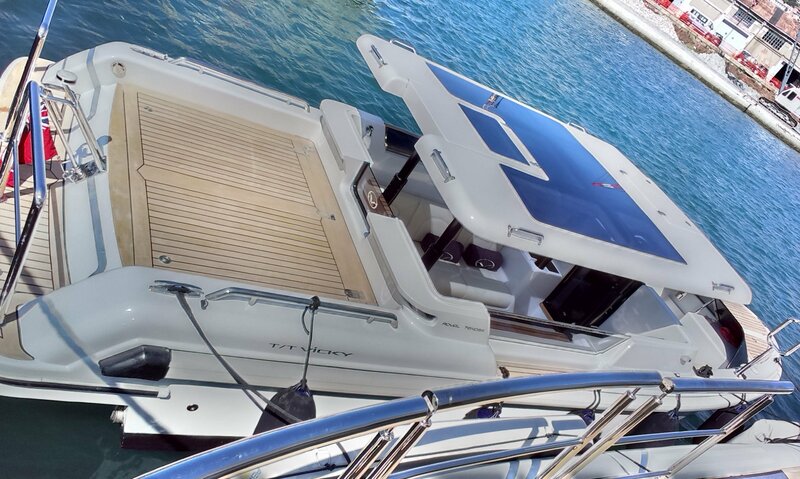 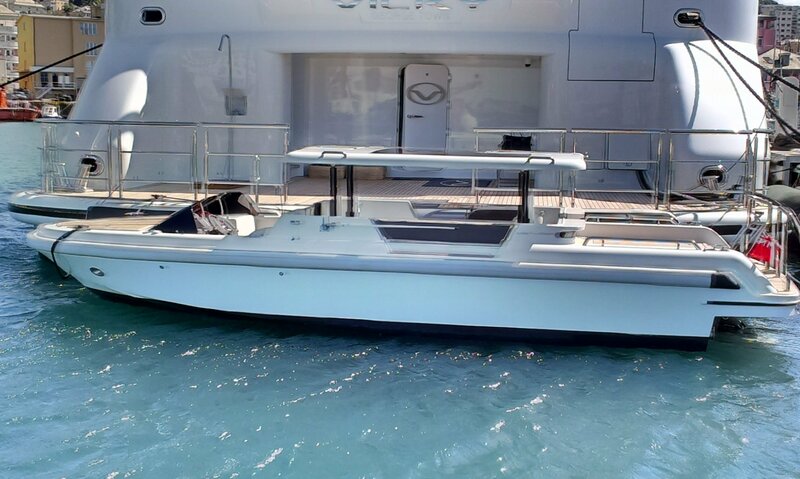 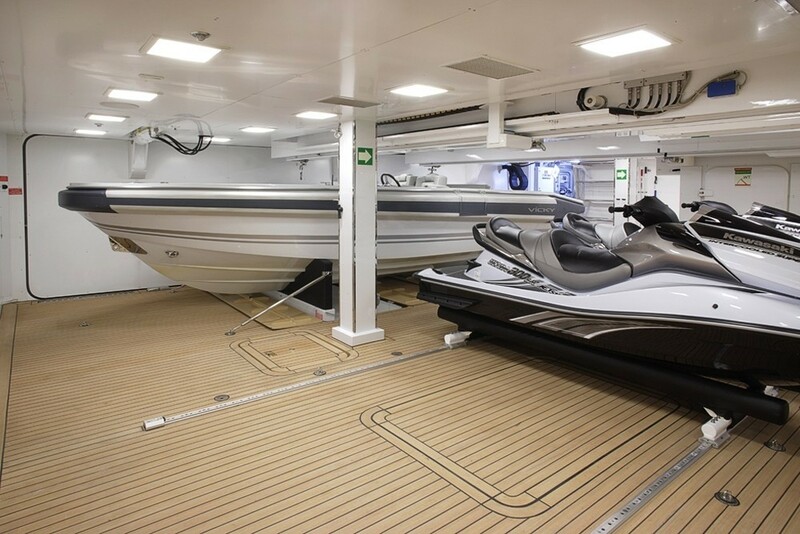 She has a shell roof on the foredeck and a sporty exterior line. 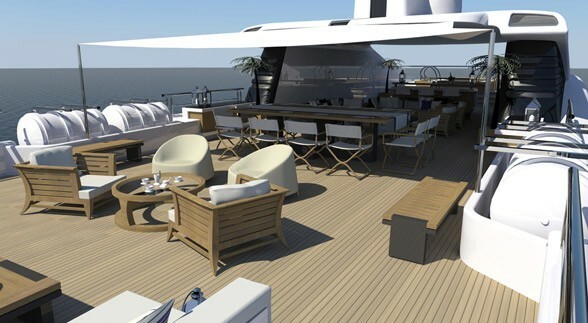 She is a spectacular vessel with elegant curves, strong graphic lines and each space has its own distinctive character. 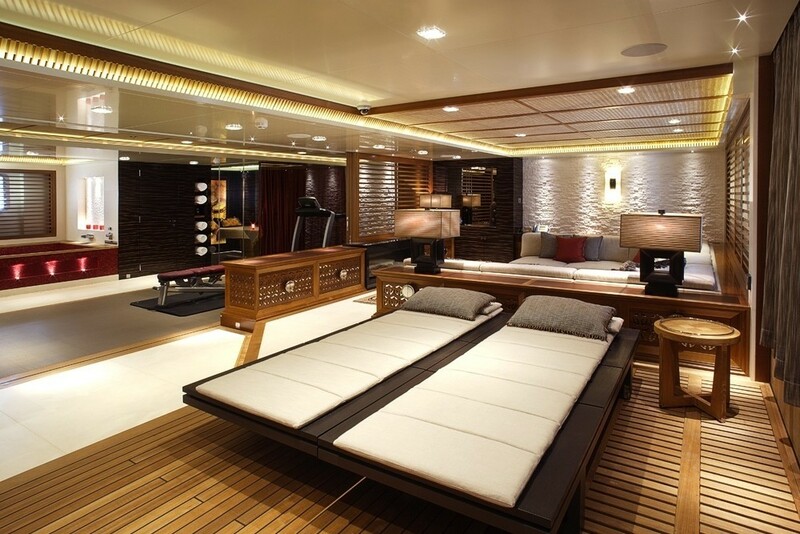 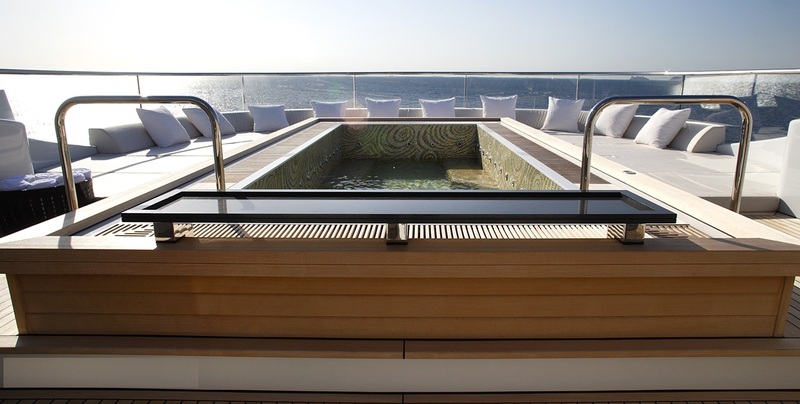 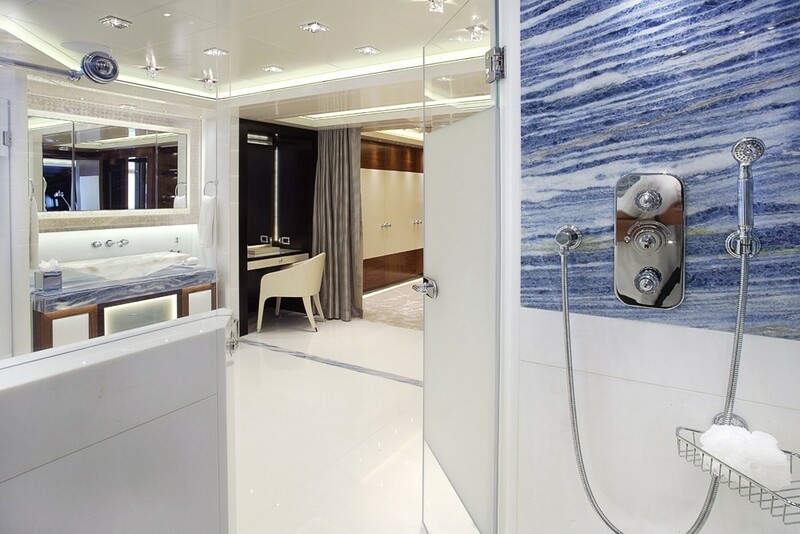 A full beam spa on the lower deck opens to water level and is positioned next to a sea platform which extends 90 degrees over the water. 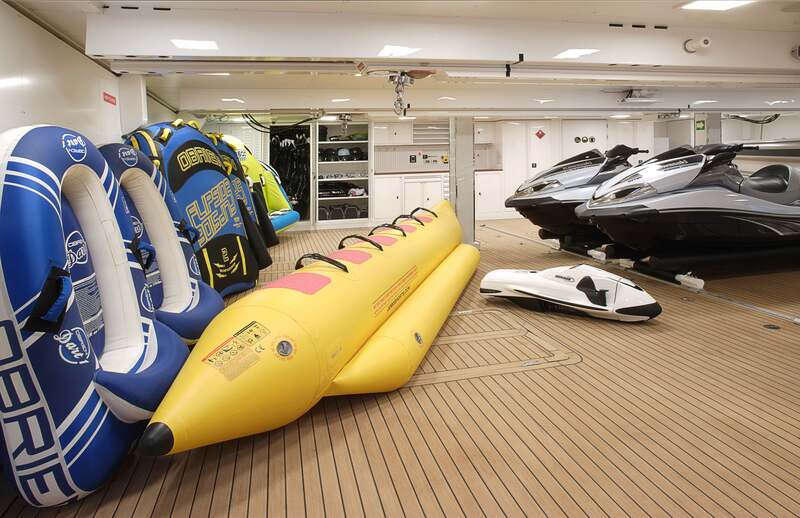 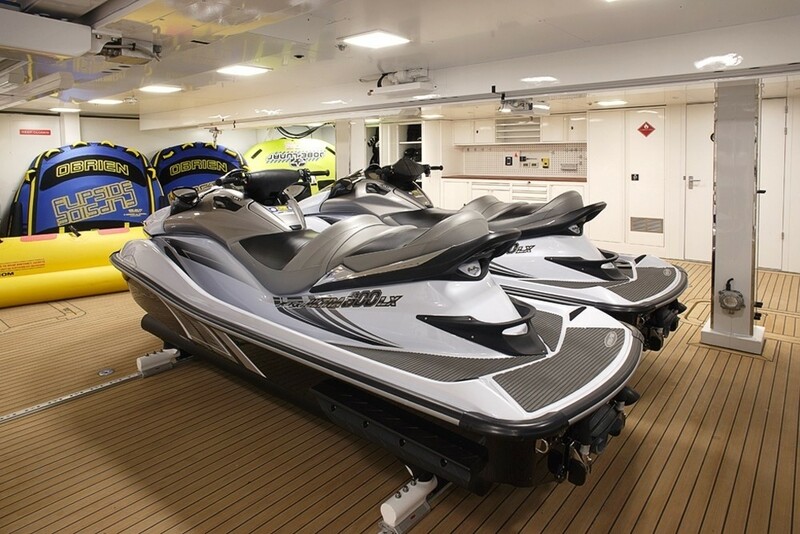 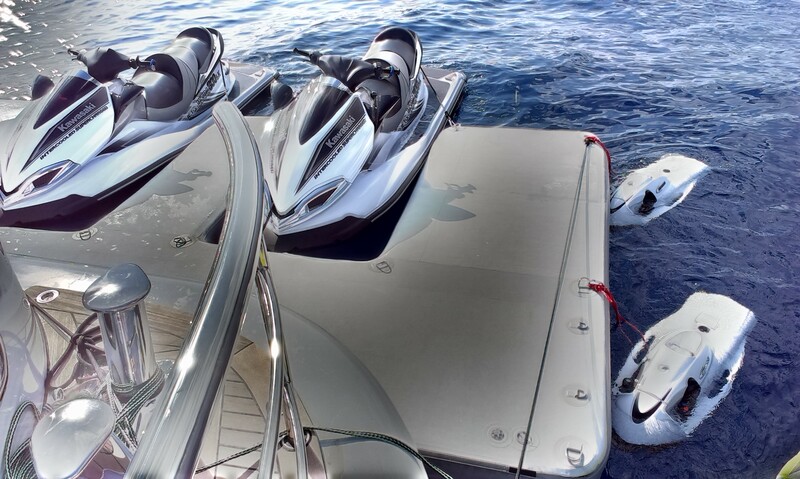 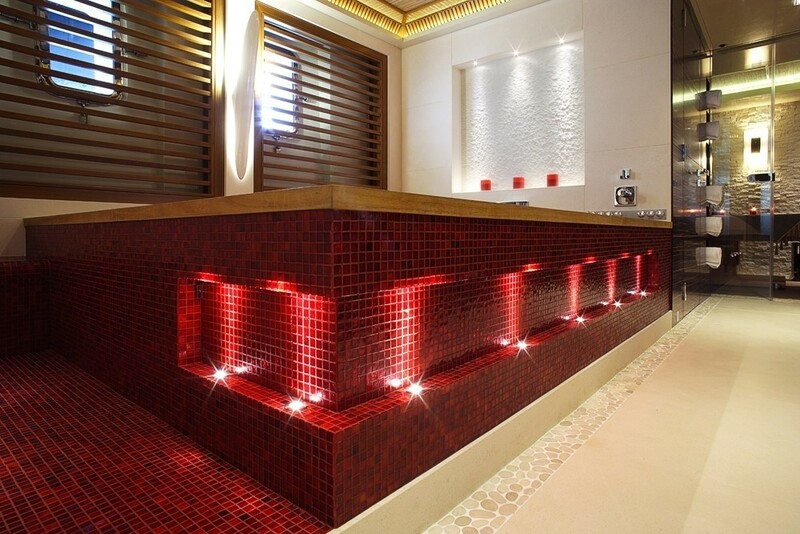 This brings guests closer to the sea to enjoy the wide variety of water toys available. 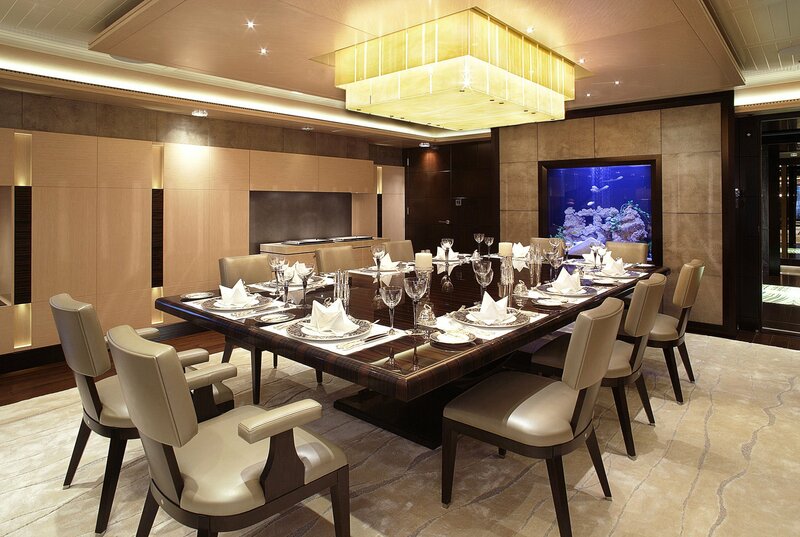 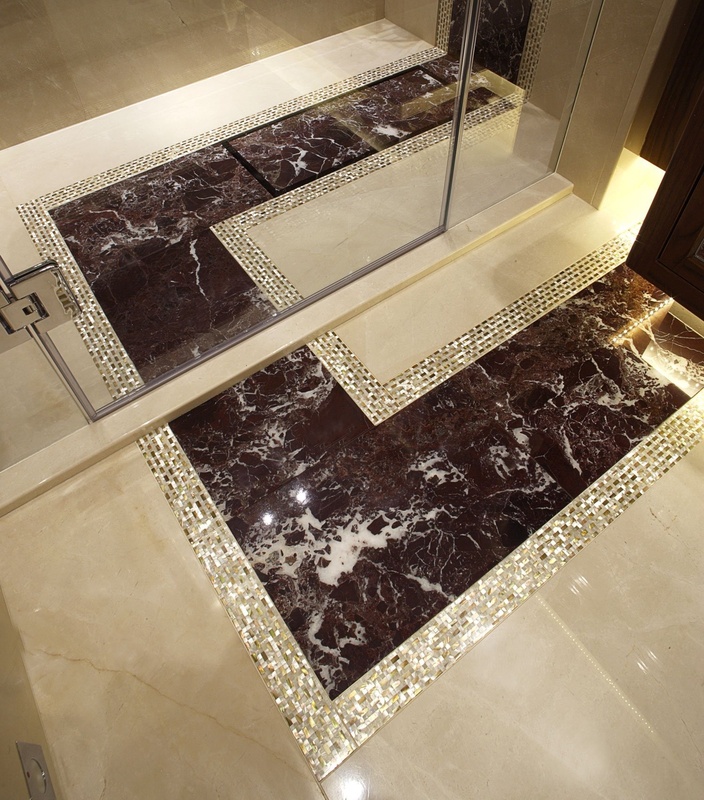 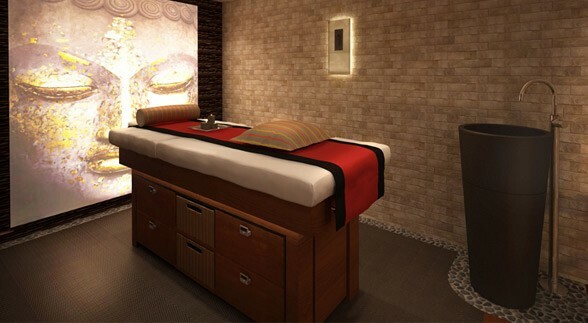 The ambiance here is quite tranquil, with a blend of teak and limestone that give a warm atmosphere. 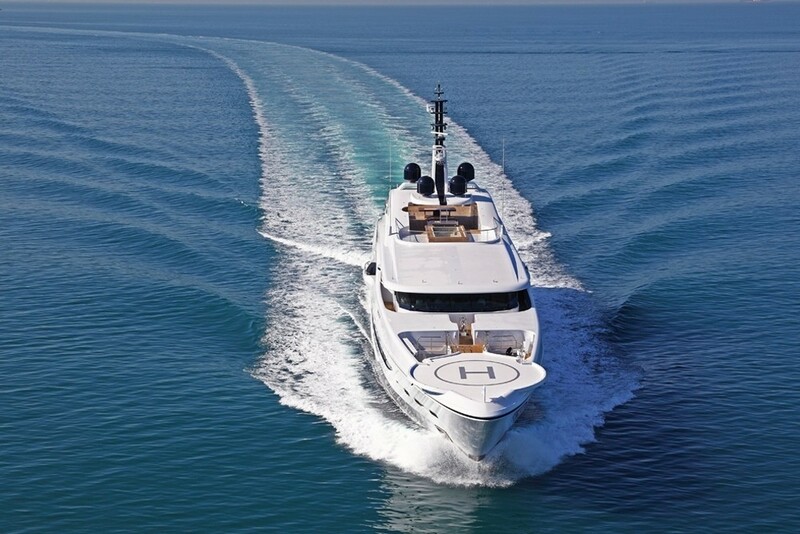 With a steel hull and aluminium superstructure, Vicky (hull NB54) achieves a top speed of 17 knots and a cruising speed of 15 knots, thanks to her twin 2,447hp Caterpillar engines. 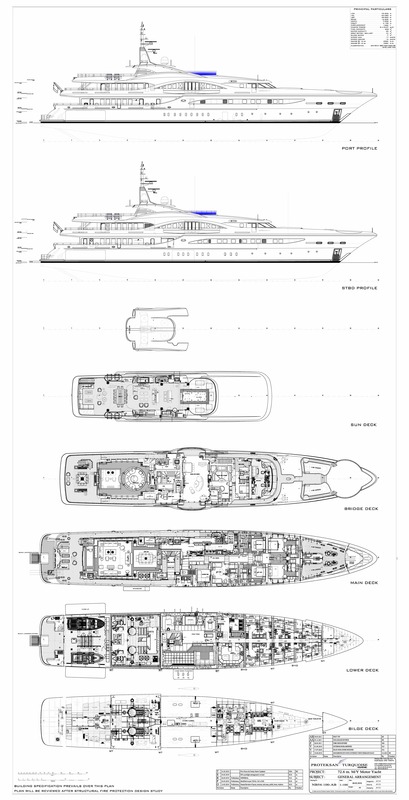 Her beam is of 12m (39´4´´) and her draft is of 4m (13´1´´). 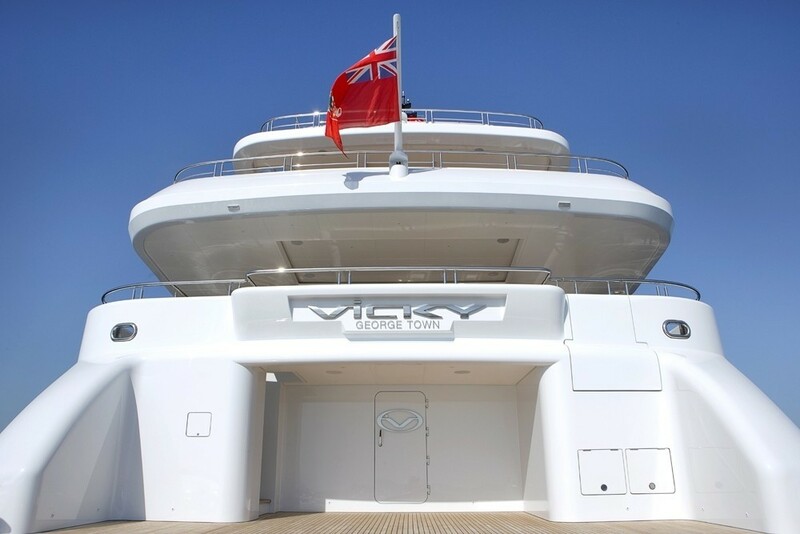 Vicky is Lloyd´s registered and MCA compliant. 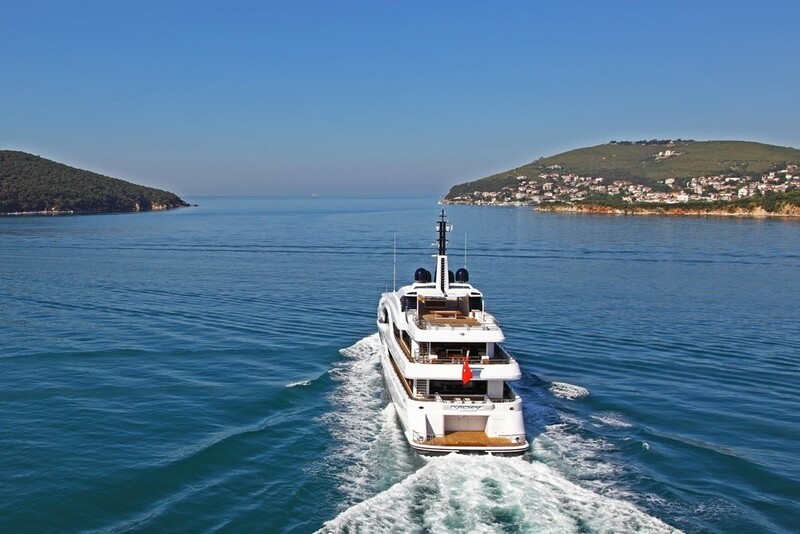 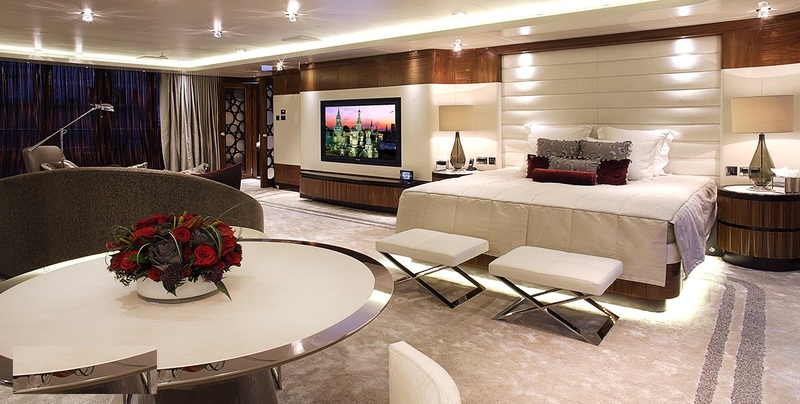 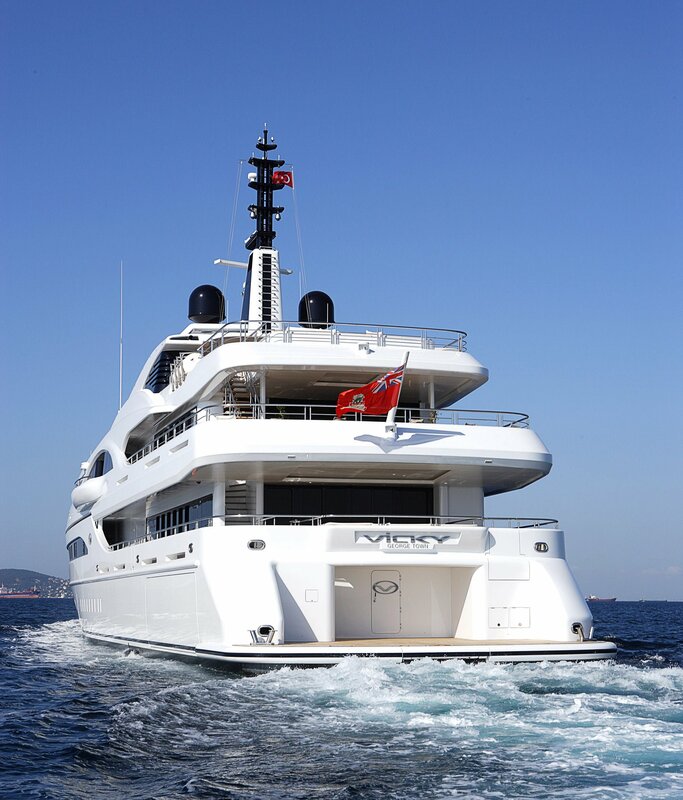 The 72.64m superyacht Vicky provides 12 guests with lovely accommodation in 6 comfortable cabins, comprising a full beam master suite situated on the bridge deck, as well as 5 guest cabins, which can be found on the main deck. 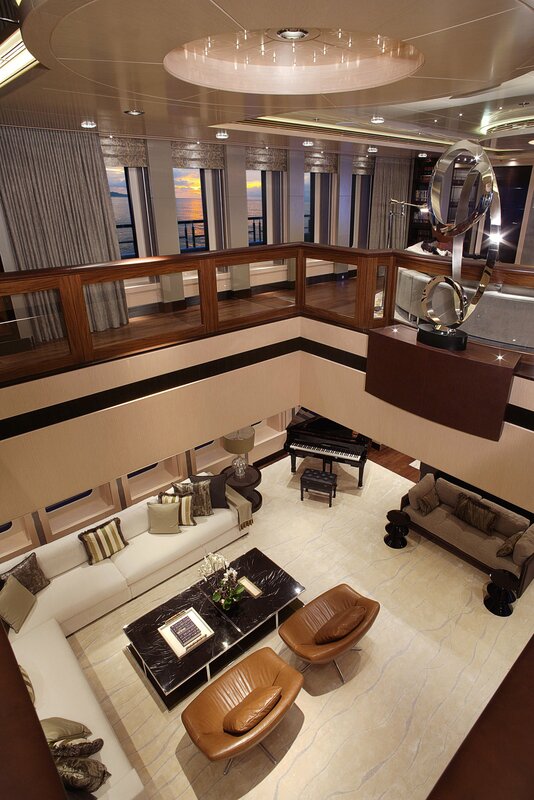 The master suite has its own private balconies that offer a stunning vista. 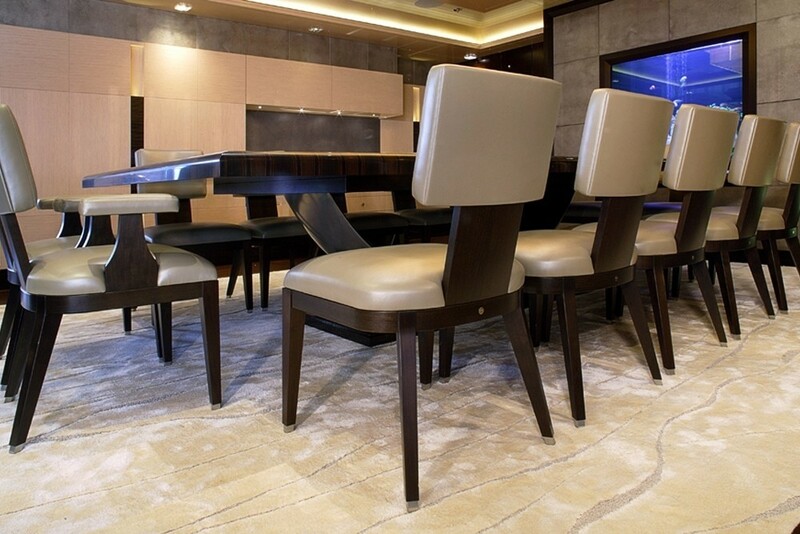 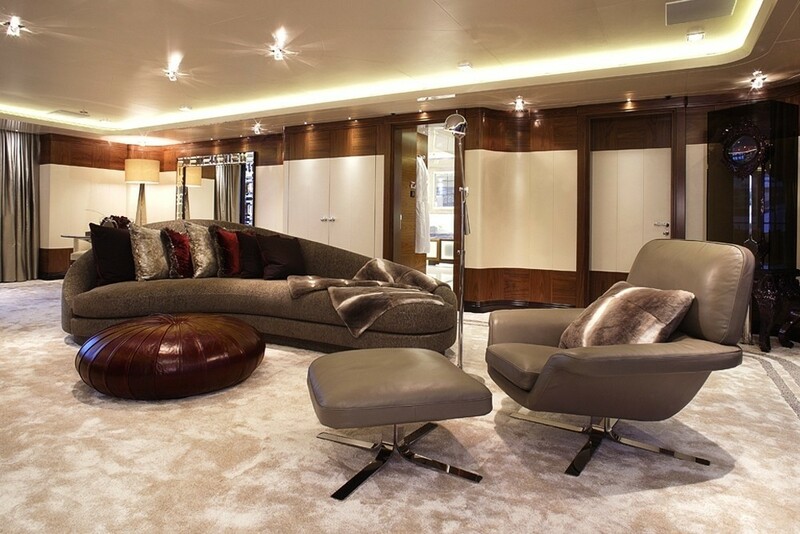 It has a rich and classic style with walnut and leather panelling, modern and eclectic furniture. 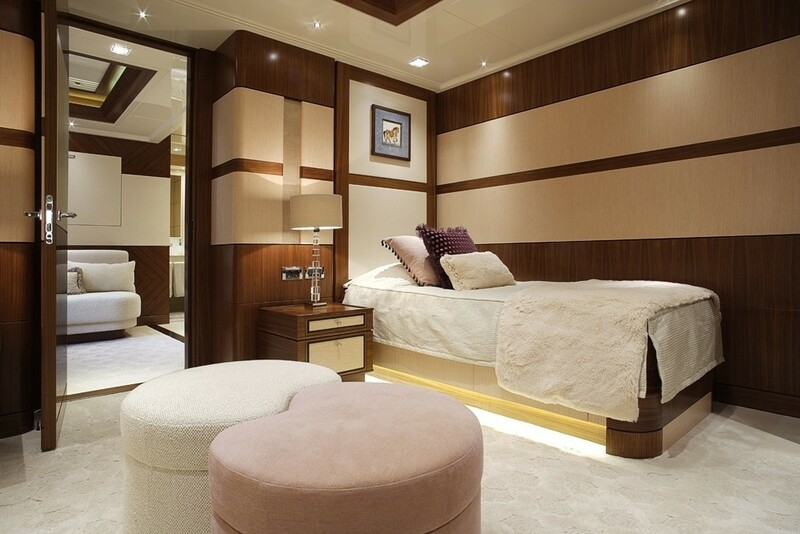 The guest cabins are all the same size, yet each have their own personal style. 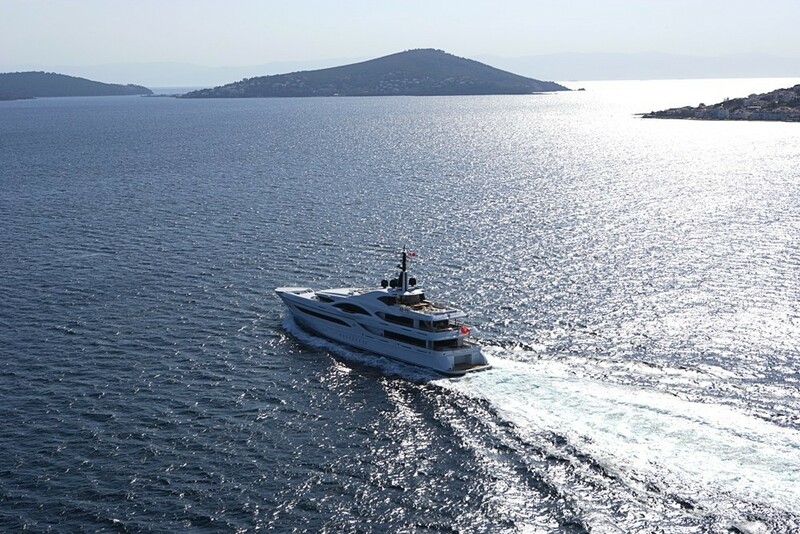 We do have available further amenity, owner and price information for the 72.6m (238'19'') yacht VICKY, so please enquire for more information.